Vanessa reigns over Germany ! From January to June 2019, two different productions in Magdeburg and Flensburg offer no less than ten opportunities to (re)discover this masterwork of modern opera. 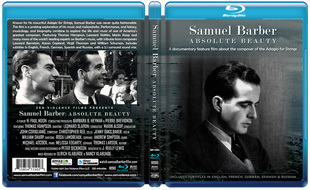 In our Documents section, focus on Samuel Barber, Absolute Beauty, the multi-award-winning documentary by Paul H. Moon. 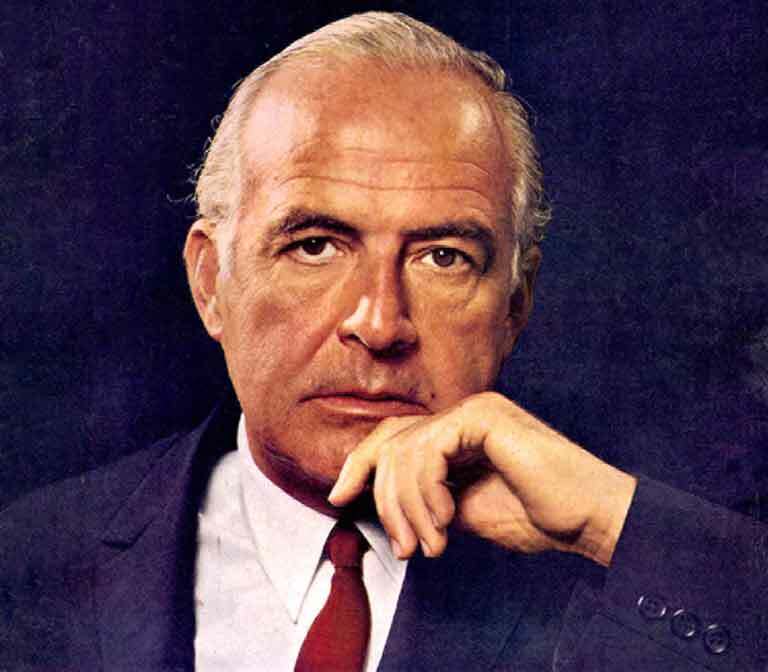 Samuel Barber was born March 9th, 1910 in West Chester, Pennsylvania, in the suburbs of Philadelphia. He grew up in a middle-class family with his father, a doctor and respected member of the Episcopalian community, his mother, an amateur piano player of Irish descent, and his sister Sara, three years younger. 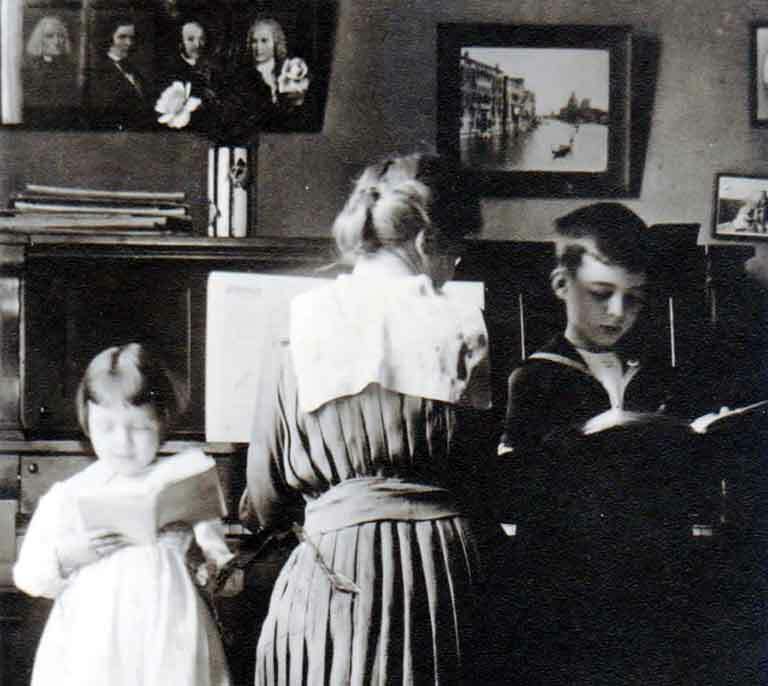 Very early in life, Samuel took piano lessons from his mother and his first teacher, William Hatton Green. Before long, his musical talent transpired. At six, he writes his first miniatures for piano and songs. His family and friends cultivate the young boy’s blooming talent. His aunt Louise Homer, a prominent contralto of the New York Metropolitan Opera, together with his uncle Sidney Homer, a famous composer of art songs, become his musical mentors. 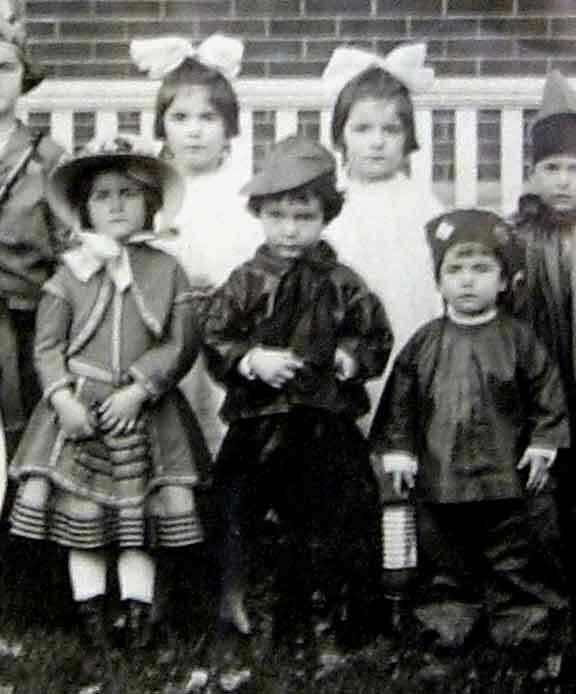 At nine, Samuel writes a letter to his mother, ending with those words: ‘I was meant to be a composer, and will be I’m sure.’ Driven by his ambition, he begins to write an opera, The Rose Tree, based on a libretto written by… the family cook. He only composes the first act, but the boy’s determination removes any doubt from his parents’ mind about their son’s musical talent. Mentored by Sidney Homer, Samuel studies music and plays the organ at a local church. 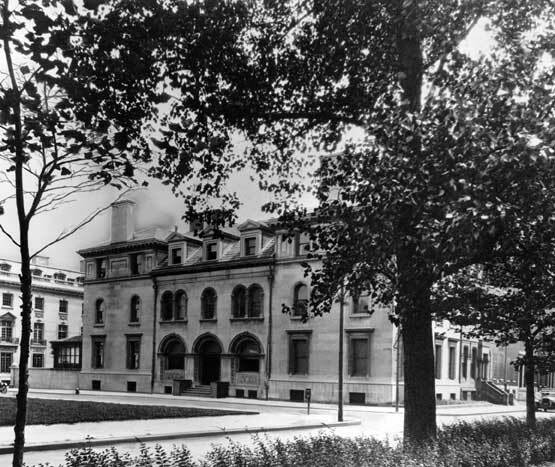 Three years later, following an audition, the director of the Baltimore Musical College insists the Barbers send their son to study at the newly established Curtis Institute of Music in Philadelphia. His intellectual and artistic training at the Curtis Institute will last ten years under the watchful eye of its founder, Mary Louise Curtis Bok. Barber's teachers are as renowned as the composer Rosario Scalero, the singer Emilio de Gogorza, the pianist Isabelle Vengerova and the conductor Fritz Reiner. His talent develops quickly and lives up to expectations. Barber has his first success with the Overture "The School for Scandal", which wins him his first prize, while another prize for his Violin Sonata (the work has been lost since) allows him to pay for his first trip to Europe. Dover Beach, for baritone voice and string quartet, the Cello Sonata and The Music for a Scene from Shelley make him one of the most talented students in his class. 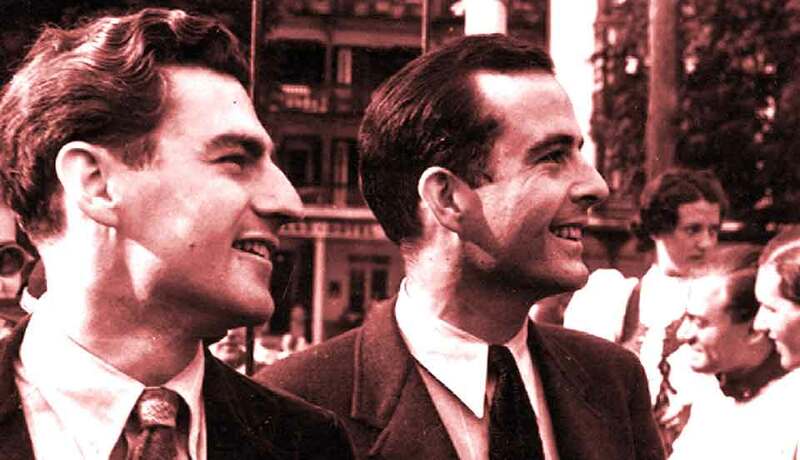 While at the Institute, Samuel meets Gian Carlo Menotti, a young Italian who speaks in halting English, and becomes his friend and alter ego. In the summer, they travel together to France, Switzerland, Austria and Germany. 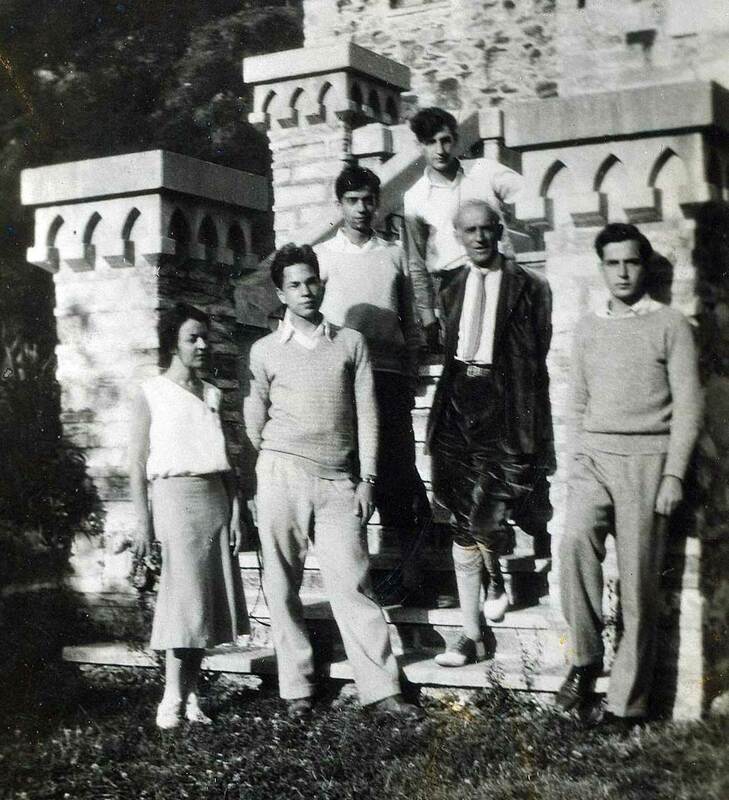 They visit Menotti's family in Italy and spend a few weeks studying at Scalero's house in the Aosta Valley. 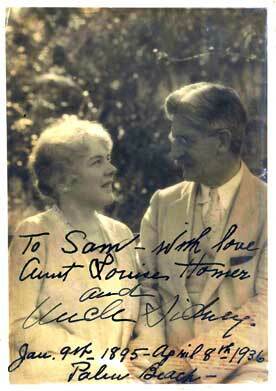 They also visit Arturo Toscanini who is on vacation near Lake Maggiore. 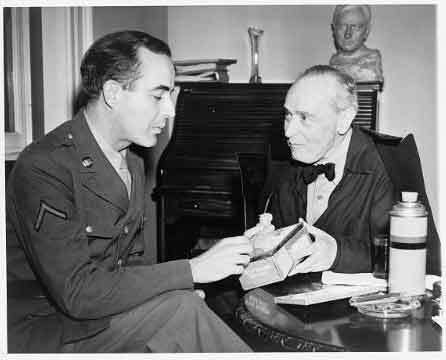 After several meetings, Toscanini informs Barber that he would be interested in performing one of his works, one day. 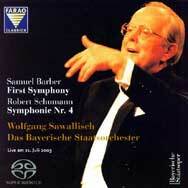 By the spring of 1935, Barber believes he still has not written a piece worth the trust the maestro has shown him. However, on three occasions his music is rewarded publicly : a radio show is dedicated to his compositions, his symphonic poem after Shelley is a tremendous success at Carnegie Hall, and the prestigious classical music publishing company G. Schirmer Inc. (New York) offers him his first contract. Before long, Barber is awarded a Pulitzer Traveling Scholarship and the American Prix de Rome, that gives him the opportunity to move to Italy and spend two years at the American Academy of Rome. 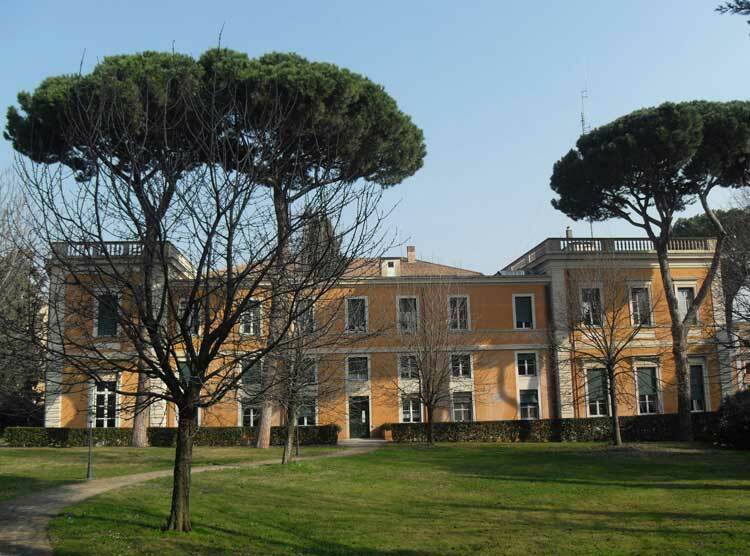 While the stay in Rome does not prove personally exhilarating as Barber finds the atmosphere at the Academy particularly elitist and stifling, he composes some of his major works there. Among them, the First Symphony (in one movement), several songs including Sure on this Shining Night, the first Essay for Orchestra and, most noticeably, the String Quartet. The last was completed during a heavenly stay with Menotti in the countryside near Salzburg, Austria. Fully aware of the quality of its slow movement, Barber transcribes it for a string orchestra and sends it to Toscanini, along with the score of the Essay. Some time later, Toscanini returns the two pieces with no comment or explanation. Barber is bitterly disappointed. 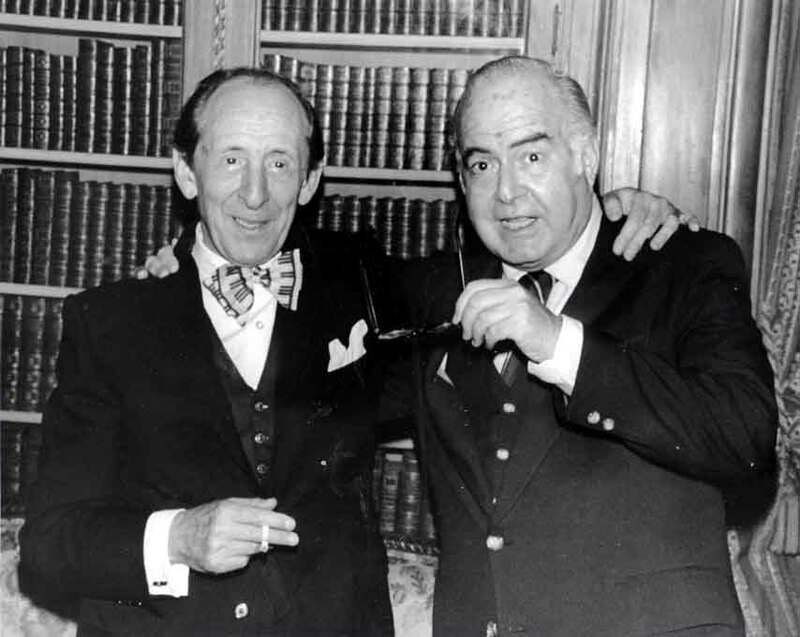 In reality, the maestro has memorized the two scores with the intent to perform the works with his NBC Symphony Orchestra at the end of 1938. 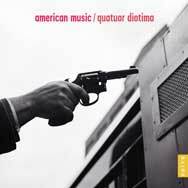 The premi&eagrave;re of the Adagio and the Essay wins rapturous acclaim. The Adagio is particularly well received and immediately becomes part of musical history - partly because of the debate it stirs in The New York Times between the partisans of the musical avant-garde and those of 'modern melodic music'. The debate is of little influence as the success of the Adagio for Strings continues until today. Barber will later come to feel that his other compositions were too often overshadowed by the Adagio. 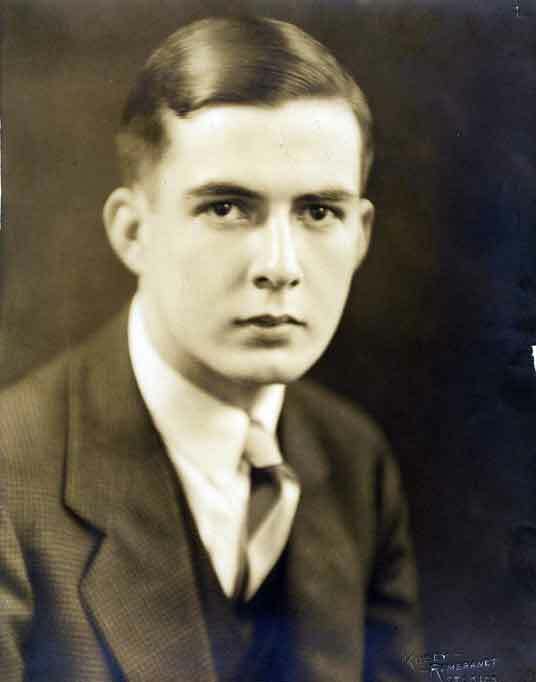 Towards the end of the 30's, then in charge of the Madrigal Chorus at the Curtis Institute, the composer focuses primarily on compositions for the choir. For the first time in Barber's career, his music appears to be linked to the outside reality of the times, with pieces such as A Stopwatch and an Ordnance Map. Undoubtedly inspired by world tensions, Barber chooses a poem by the English writer Stephen Spender where the death of a soldier in the International Brigades is depicted during the Spanish Civil War. 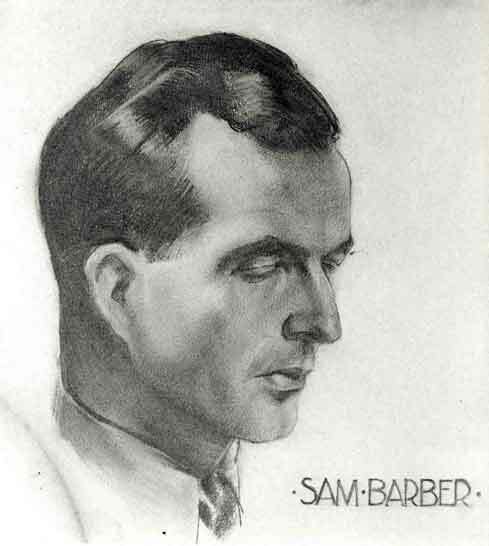 History soon impinges upon Barber's creative surroundings: while on vacation in Europe, working on the Violin Concerto commissioned by an industrial tycoon from Philadelphia, Barber is forced to leave France as the Nazi Germany threatens to enter the country. He completes the concerto onboard a transatlantic ship returning home to the United States. Energizing and vibrant, the Violin Concerto's finale soon becomes, and continues to be, the favorite of many violinists all over the world. An interesting note, the violinist for whom the concerto was commissioned eventually turned it down, deeming the last movement too different from the rest of the work. 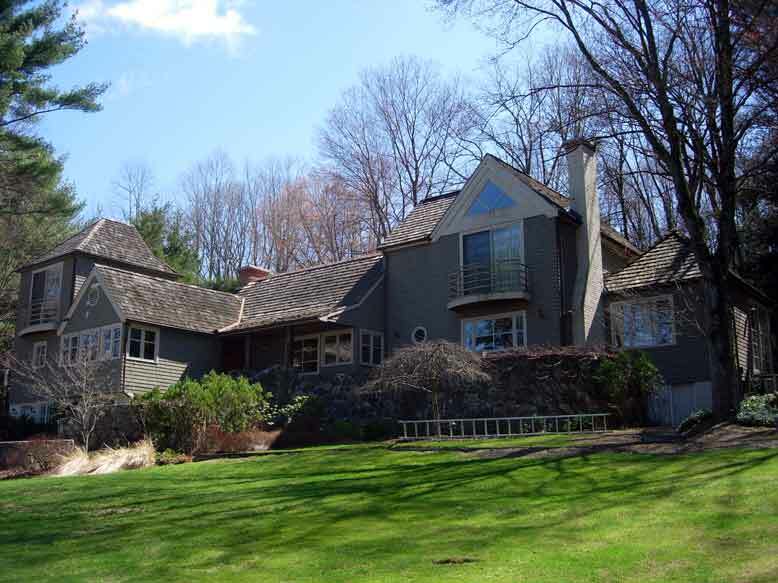 In the midst of those troubled times, Barber and Menotti - with the financial support from Mary Louis Curtis Bok - purchase a house in Mount Kisco, in the leafy suburbs of New York City. This is a time of happiness for Barber. The house in the woods is named Capricorn and Barber, Menotti and the poet Robert Horan move in together, far from the urban hubbub. Life in the country home becomes an inspiration to the composer. There, he writes the Capricorn Concerto, a work reminiscent of a baroque concerto grosso, where three solo instruments seem to portray the three friends. 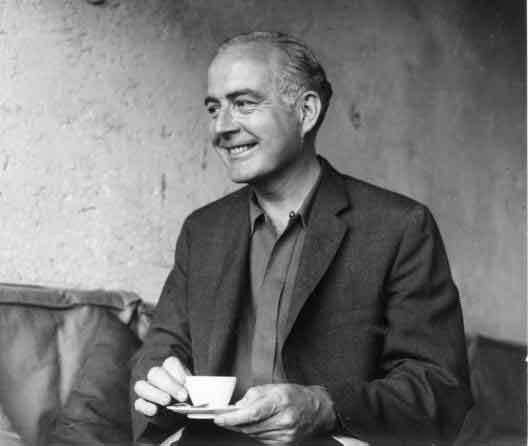 Together with the Excursions for piano, completed at the end of 1942, the Capricorn Concerto is one of the few 'light-hearted' works Barber writes during those years..
After the war, Barber experiences an intensely creative period on two fronts. While he meets many of the musicians and singers who are to become his ‘champions’, he is also greatly stimulated by commissions for genres he has not yet fully explored, such as ballet, instrumental music, vocal music with orchestra and opera. Thanks to the network of important figures of the American musical world he’s developed during the previous decade, the post-war period proves extremely fruitful for the composer. Through a private sponsor, conductor Serge Koussevitzky commissions Barber to write a concerto for his protégée, the Russian cellist Raya Garbousova. In 1942, the composer had previously committed to write a cantata for solo singer, choir and orchestra for Koussevitsky (he will eventually complete the Prayers of Kierkegaard in 1954). 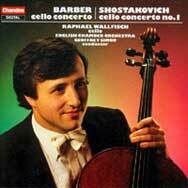 Barber immediately starts working on the Cello Concerto. Surprisingly, the collaboration with Garbousova generates some tension between the two, but Barber considers the concerto a masterpiece. In 1954, he even chooses to conduct it – something he very rarely did - with cellist Zara Nelsova for a Decca/London recording. 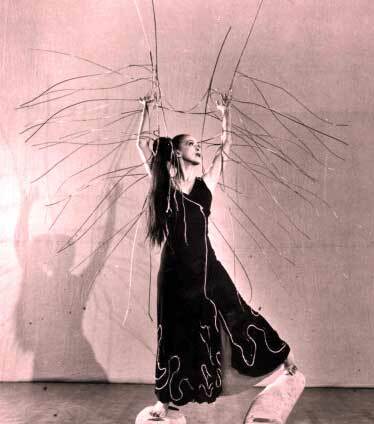 Another significant commission takes the shape of a ballet for the Martha Graham Dance Company, one of the most avant-garde American dance company of the time. Graham has already commissioned works by Aaron Copland and Carlos Chavez and she turns to Barber with a story based on the theme of Medea. Serpent Heart, written for chamber orchestra and later turned into a symphonic suite known as Cave of the Heart, receives much public and critic acclaim. (The choreography, however, is not greeted with the same enthusiasm.) In 1946, the Barber family is struck by two distressing events. Both Louise Homer and Barber’s father become seriously ill. A powerless witness to the physical degradation of his relatives, Barber composes a deeply nostalgic work after the short prose poem Knoxville, Summer 1915 by the American writer and journalist James Agee. It depicts a quiet evening in a Southern family, seen through the eyes of a child. Starting in a pastoral atmosphere, the descriptive music slowly turns into the unnerving confidence of a child questioning his place in the universe. The composer has never put so much of himself in his art before. The work is completed in April, 1947 and Barber’s aunt passes away in May, followed three months later by his father. The first performance of Knoxville, Summer of 1915 is sung by soprano Eleanor Steber at the dawn of her career. 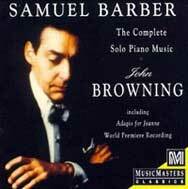 In the fall of 1947, after a summer of mourning, Barber begins work on a piano sonata which he completes in the spring of 1949 after a tormented gestation period. 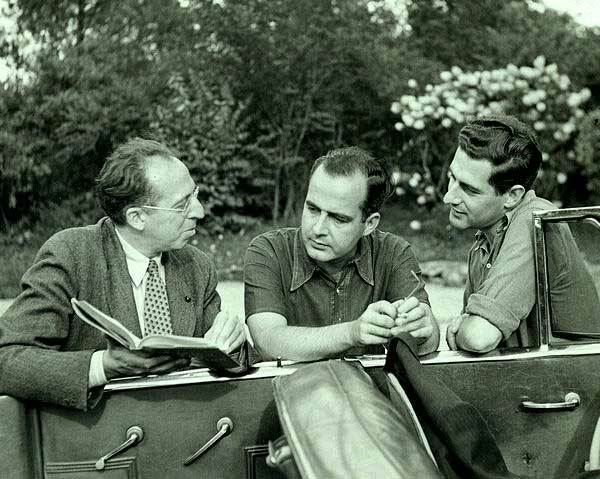 Enthused by his new acquaintance, Vladimir Horowitz, (who has already performed three of Barber's four Excursions during the war) and boosted by a commission for the 25th anniversary of the League of Composers, Barber throws himself into the challenging piece. The work consists in four movements based on four distinct topics conveying Chopin, Rachmaninov, Liszt and Prokofiev. Each movement is of a different harmony including an attempt at dodecaphonic music, a complete novelty for Barber. The last movement, a furiously virtuoso fugue, takes time to compose. 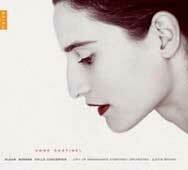 But the resulting score, heavy with an intense sense of drama, proves extremely efficient. The Sonata has since been regarded by pianists and the public alike as a masterwork in the repertoire. In comparison to the painful birth of this monumental composition, Barber’s next three works sound more peaceful, almost like intervals. However, each of them exudes some form of darkness, expressed through the notion of time passing in the song-cycle Mélodies Passagères (dedicated to the French duo Francis Poulenc-Pierre Bernac), in the omnipresent quest for solitude of the Hermit Songs (based on anonymous lyrics by 8th-13th centuries Irish monks and sung by Leontyne Price), as well as in the autumnal atmosphere of the wind quintet, paradoxically called Summer Music. With Prayers of Kierkegaard, a mystical cantata for solo singer, mixed choir and orchestra, Barber embraces once again an ambitious form. However, in the mid 50’s, a new challenge awaits him. That challenge comes from “The Met.” In 1952, Barber has refused an offer to write an operatic work from Rudolf Bing, the director of the New York Metropolitan Opera. Eventually, Barber agrees to compose his first opera if Menotti writes the libretto. 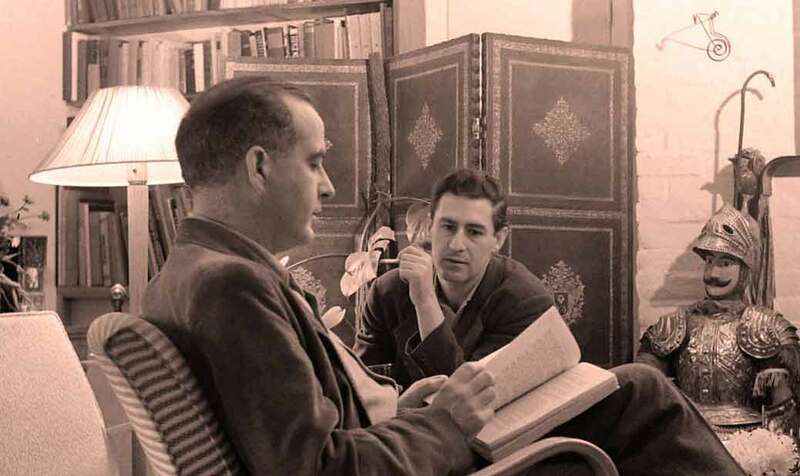 Bing has no reason to refuse : having been awarded two Pulitzer Prizes for his operas, The Consul in 1950 then The Saint of Bleecker Street in 1955, Barber’s companion is already widely recognized as a highly talented drama-writer. Unexpectedly, the pair find their inspiration in the Seven Gothic Tales by the Danish writer Isak Dinesen (aka Karen Blixen). The background atmosphere of the bitter-sweet opera Vanessa is set “in a Northern country, around 1905”. The story revolves around a middle–aged woman and her young niece, Erika. The woman is obsessed by her memory of a lost love and the young girl falls in love with a handsome man who takes refuge in their chalet in the middle of a snowstorm. 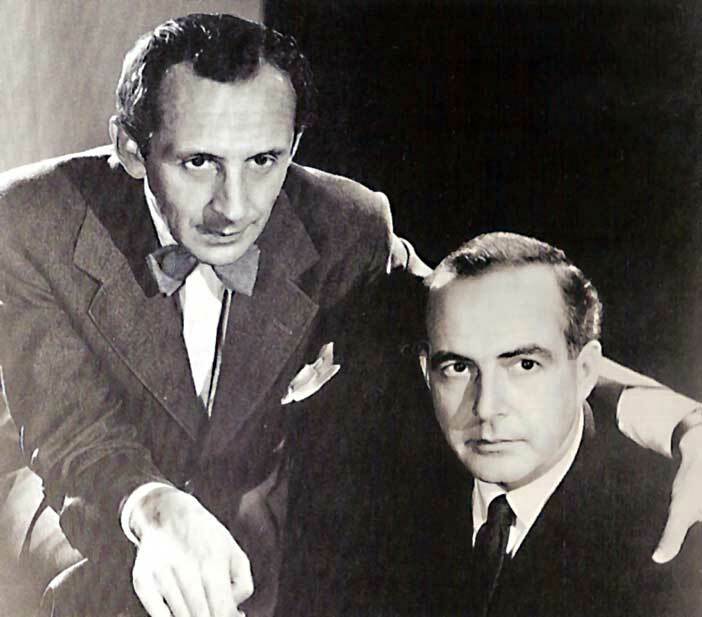 Barber and Menotti put in place a cruel game of confused feelings versus the power of reason, set somewhere in between dreamland and reality. All in all, the plot is somewhat reminiscent of Schnitzler’s La Ronde or Chekhov’s The Cherry Orchard. 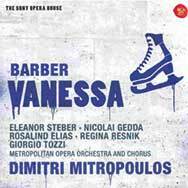 Barber initially writes the role of Vanessa for Maria Callas, who comes to Capricorn during the summer of 1956 to read the libretto and listen to the music. Surprisingly, after the audition, the diva turns down the offered role. She legitimately feels that the real heroine of the drama is Erika, not Vanessa. The Yugoslav soprano Sena Jurinac is then chosen for the leading role but two weeks before the première, she unexpectedly cancels her engagement. 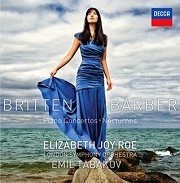 Barber turns to the promising Eleanor Steber. 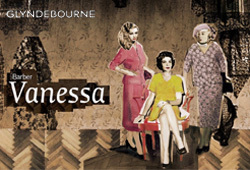 The choice will prove a much inspired one : after her triumphant performance on June 15th, 1958, the young singer’s name will forever remain associated with the character of Vanessa. The cover story of Newsweek magazine reads ‘An American masterpiece’; ‘At last, an American grand opera!’ exclaims Dmitri Mitropoulos, the conductor of the first performance. 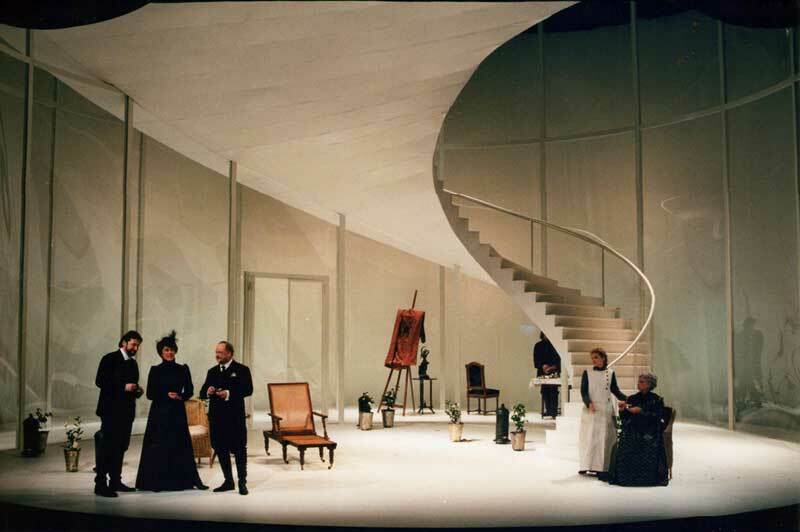 At the Salzburg Festival a few months later, critics seem a little less enthusiastic, and as the 60’s passes by, the opera appears to be less frequently produced. 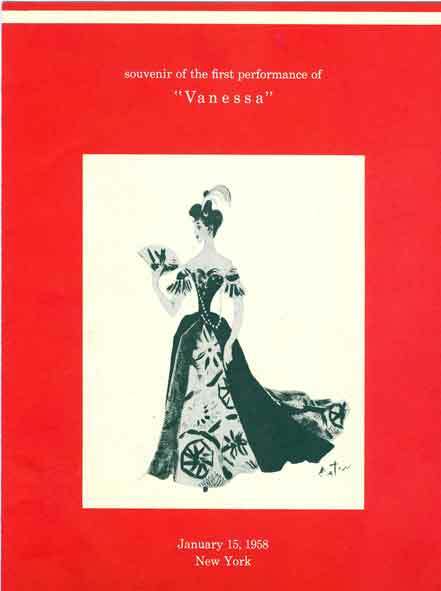 However, the music of Vanessa, with its splendid quintet in the 4th act, remains a masterpiece reference in the history of the 20th century opera. 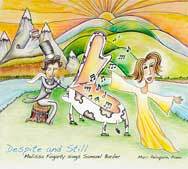 Many of its arias and the delicious choral setting of “Under the Willow Tree” are still regularly performed in concert. In 1958, the Pulitzer Prize for Music is awarded to Vanessa, making Barber one of the most famous and sought-after American composers. Prestigious commissions are expected. 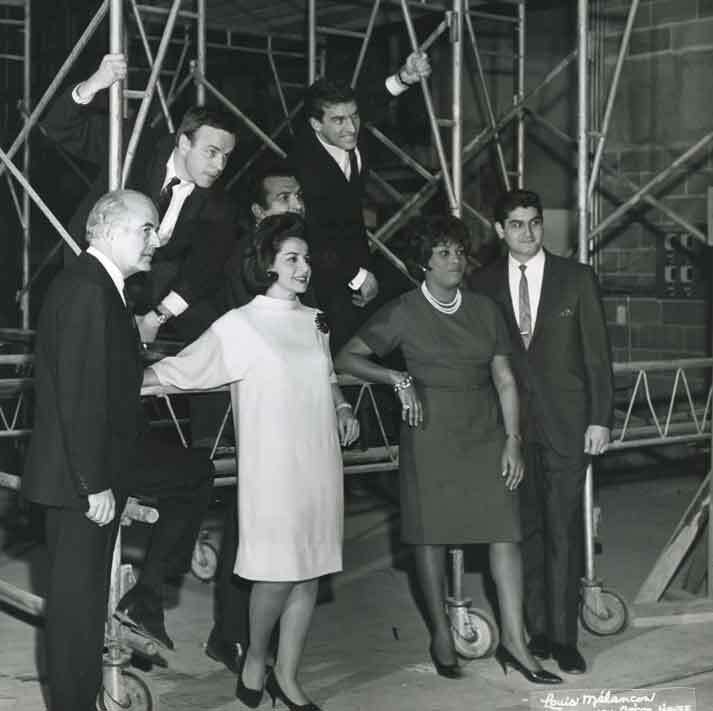 Soon a venue stands out for his next composition : the new Lincoln Center for Performing Arts is to open between 1962 and 1966. 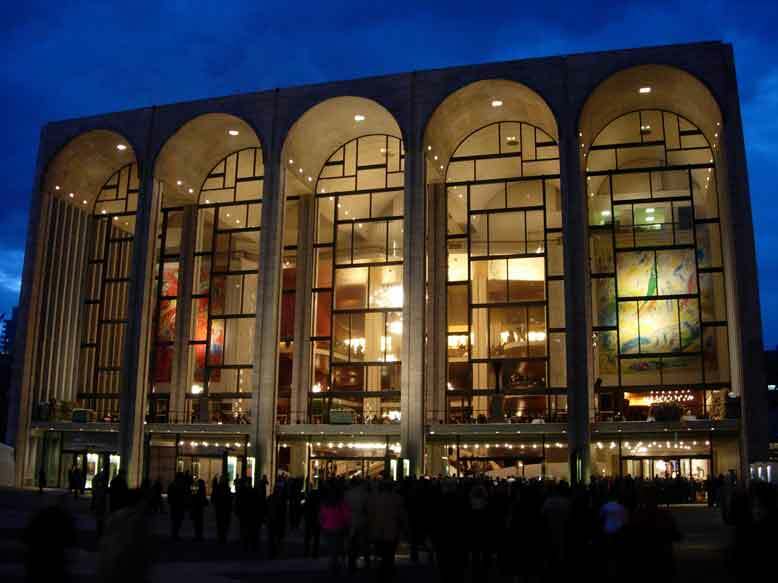 Located in the heart of Manhattan, the architectural complex is to house the new Metropolitan Opera, the New York Philharmonic, the Juilliard School of Music, the New York City Opera and the New York State Theater. Barber’s Piano Concerto and Andromache’s Farewell are included in the inaugural season of the Philharmonic Hall. If the delivery of the Piano Sonata has proven a painful process, writing the Piano Concerto parallels yet another personal grieving period for Barber. In July 1961, his sister dies. Over the ensuing period of creative block, Barber has a chalet built in the Italian Dolomites that will later become his refuge and lair on the Old Continent. Meanwhile, the concerto is still in search of its last movement. 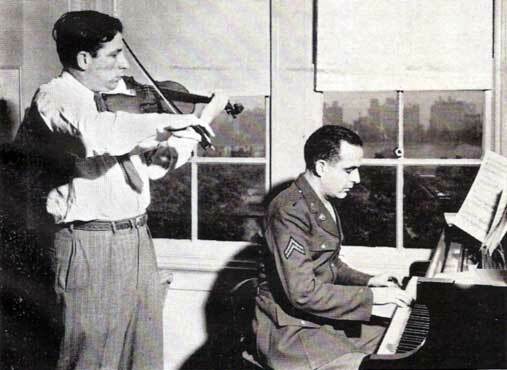 On his return from a trip to Russia, where the Congress of Soviet Composers has welcomed him as a guest of honor, Barber finally begins composing again, encouraged by Vladimir Horowitz and John Browning (to whom the concerto will eventually be dedicated). When the final Allegro Molto is completed, Browning, who is to perform the work, has only two weeks and a limited number of rehearsals to memorize the score and polish his playing. Despite the rush of the last weeks, both the soloist and the conductor, Erich Leinsdorf, receive a standing ovation for their performance. 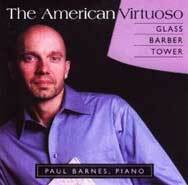 Some months later, Barber is awarded his second Pulitzer Prize, crowning the achievement of the Piano Concerto. The atmosphere surrounding the writing of Andromache’s Farewell, a concert aria written for the young American singer Martina Arroyo, is altogether different. The complicity and serenity of the relationship between Barber and Arroyo act as an enchantment. Again, the première of the work ends in extended praise from the public and critics alike. 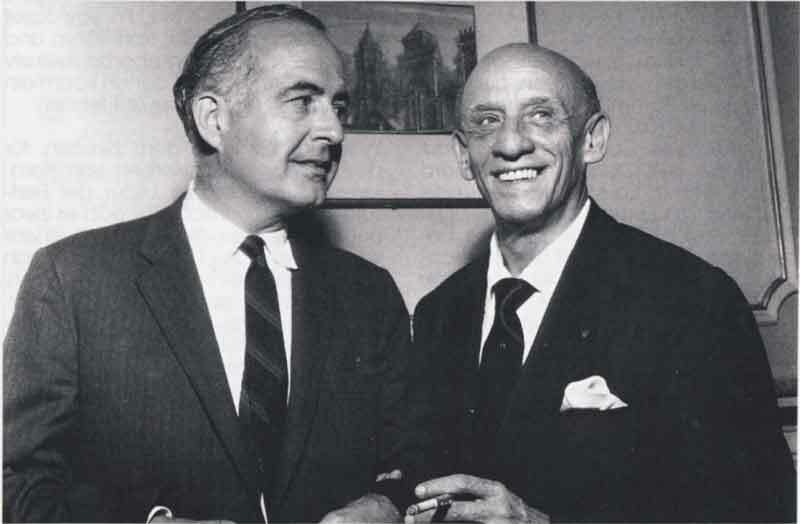 This wave of success encourages Barber to accept the commission for a second opera, planned for the opening of the new Met in the fall of 1966. 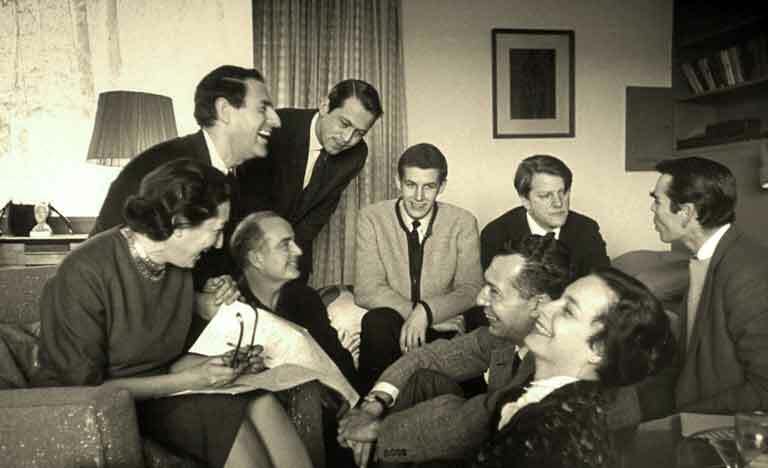 As for Vanessa, the composer takes a while to settle on a subject, partly because Menotti has been excluded from the project. In the end, the Shakespearian tragedy Antony and Cleopatra is chosen, and the Italian director Franco Zeffirelli is appointed to write the libretto and stage the opera. 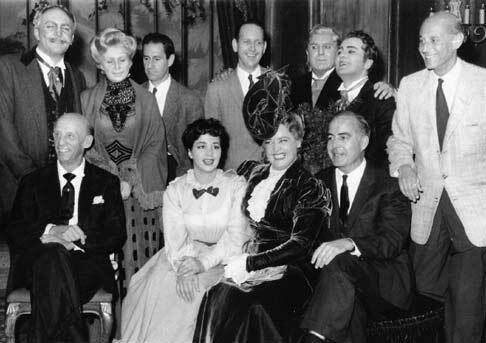 Immediately, Barber finds himself under a large amount of political and media pressure as everyone in America is expecting the evening of September 16th to be a historical date, forever remembered by the entire nation as the night when the Metropolitan Opera became the greatest opera theater in the world. Barber and his stage director-librettist however seem to disagree on a number of points, and generally do not share the same vision of the opera. On top of the ominously difficult collaboration, a threat of a musician’s union strike does not bode well for the entire production. 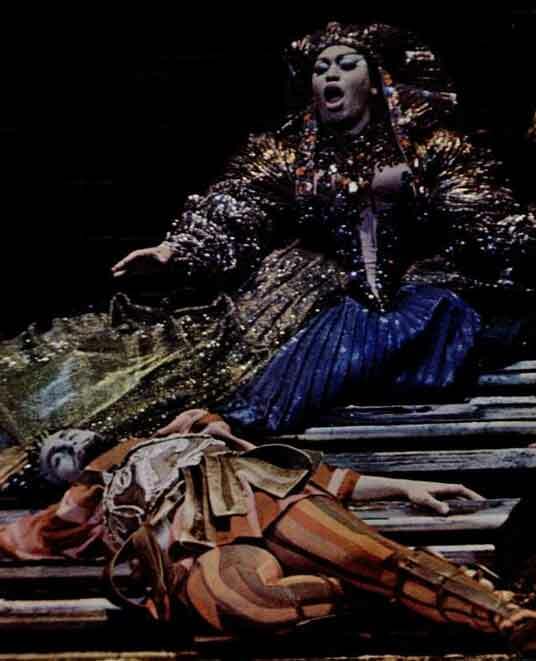 Despite the fantastic vocal performances of both Leontyne Price and Justino Diaz, the première of Antony and Cleopatra is a complete fiasco. Barber’s music does not live up to the grand atmosphere of the story, Zeffirelli’s costumes and sets, with their hundreds of extras and live animals on stage, make the show a grand and somewhat kitsch Hollywood costume drama. Its overabundance of performers and gaudy scenery literally breaks the new staging machinery. Five hours after the curtain was raised on Antony and Cleopatra, the ovations of the 4 000 people in the audience do not fool anyone. The next morning, when Barber embarks for Italy without even reviewing the papers, he’s seen more to be fleeing than traveling. A litany of disappointments and grievances punctuates the last fourteen years of Barber’s life. A few months after the failure of Antony and Cleopatra, his mother passes away and, affected by the uncertainty surrounding his relationship with Menotti, Barber becomes depressed. 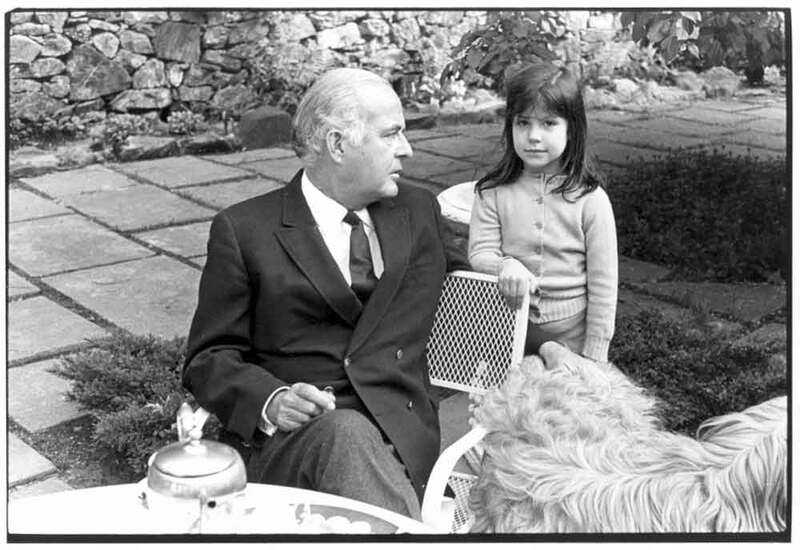 The last straw occurs when Menotti, who has just bought a huge mansion in Scotland, demands that Capricorn be sold. Barber is forced to sell the property that was associated with his creative life for nearly thirty years. He returns to New York almost an exile. 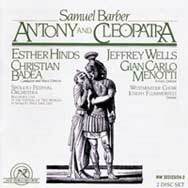 Early in 1975, the Juilliard School of Music stages a new production of Antony and Cleopatra, in an abridged and revised version Barber has written with the assistance of Menotti. It’s the last time the two men will work together. The experience momentarily reconciles Barber with life, but it only lasts a moment : a certain bitterness develops in him towards the new generation of people who have stopped appreciating his music. Praised yesterday, his works now seem disregarded, in a time when American music - and all music for that matter – has necessarily to be “resolutely modern”. 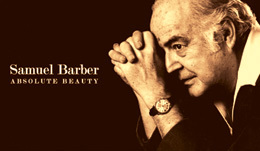 Barber always spoke openly of his scorn for the icons of so-called “modern music”, from Charles Ives to Elliott Carter. 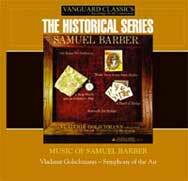 In the 60’s and 70’s, the neo-romanticism that characterizes Barber’s music is looked upon with suspicion, even contempt. Feeling ostracized, Barber gradually withdraws from the musical milieu. Vanessa at the Glyndebourne Festival 2018 (Emma Bell, Virginie Verrez, Edgaras Montvidas, Rosalind Plowright). Vidéo available until 02/14/2019. « O Boundless, Boundless Evening (extr. 3 Songs op.45) » Capricorn Concert « Le Dandy & le Voyou » (François Leroux, baryton / Jeff Cohen, piano / Paris; Théâtre Adyar, 10-09-2010)"
« A Last Song (extr. Despite and Still) » Capricorn Concert « Le Dandy & le Voyou » (François Leroux, baryton / Jeff Cohen, piano / Paris; Théâtre Adyar, 10-09-2010)"
« St. Ita's Vision (extr. Hermit Songs) » Capricorn Concert « Le Dandy & le Voyou » (François Leroux, baryton / Jeff Cohen, piano / Paris; Théâtre Adyar, 10-09-2010)"
« Départ (extr. Mélodies Passagères) » Capricorn Concert « Le Dandy & le Voyou » (François Leroux, baryton / Jeff Cohen, piano / Paris; Théâtre Adyar, 10-09-2010)"
Finale Allegro con spirito of the « Piano Sonata » (Arisa Sakai, (Concours Reine-Elisabeth, Studio 4, Flagey, 10-05-2013)"
Vanessa at the Glyndebourne Festival 2018 (Emma Bell, Virginie Verrez, Edgaras Montvidas, Rosalind Plowright, staging director Keith Warner). Complete video available until 02/14/2019. 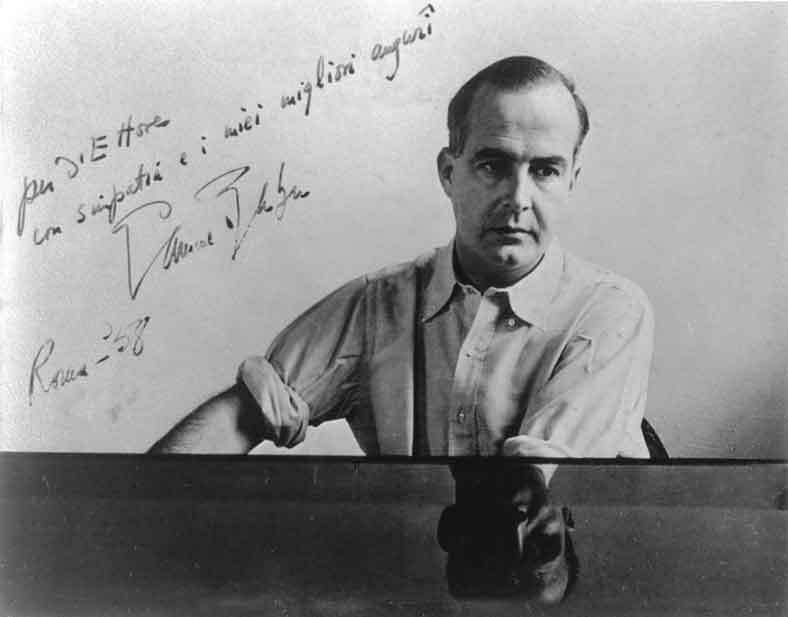 The complete catalogue of Samuel Barber's works consists of 50 opus and 120 various compositions bearing no opus number, among which the American biographer of Barber, Ms Barbara Heyman, lists almost 70 art songs. The two catalogues below present Barber's works, sorted either by dates or by musical category. Initiating and/or relaying Barber events organized on both sides of the Atlantic. To become a member of Capricorn, please click here. 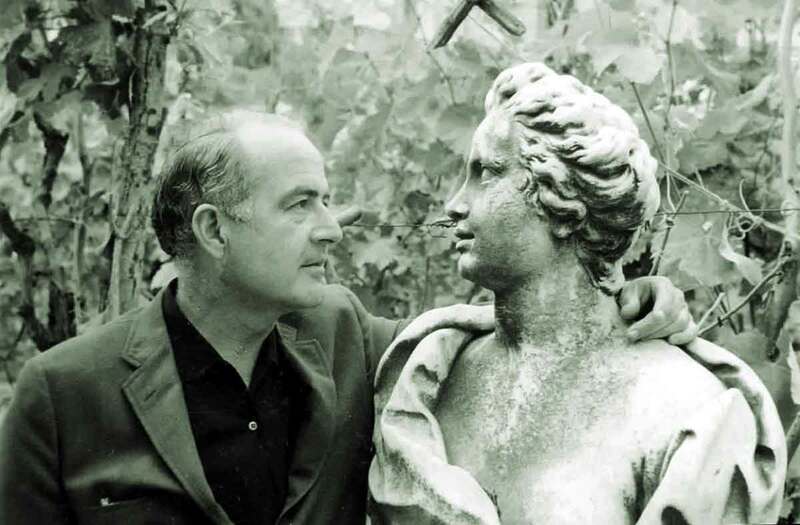 « A Composer For Our Time » : portrait of Samuel Barber and discography by Pierre Brévignon (Classica magazine, September 2010). 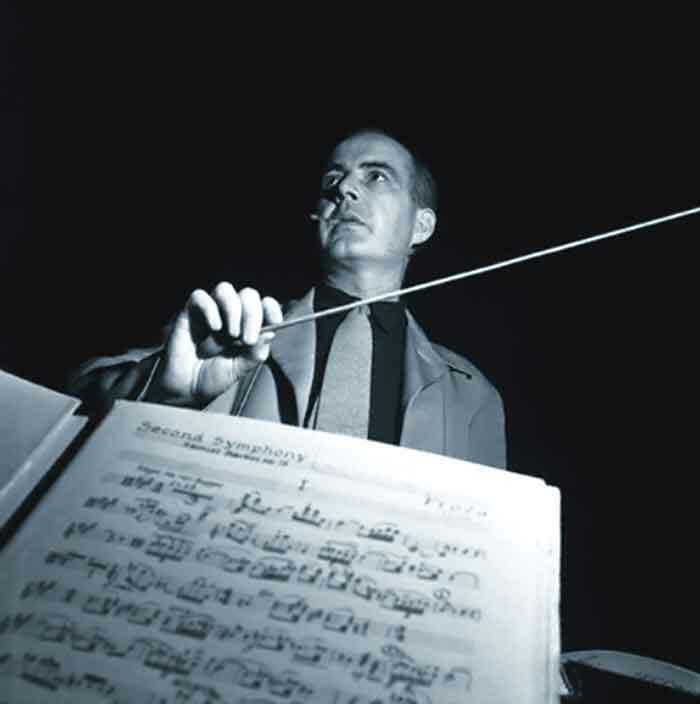 « Samuel Barber : A Forgotten Neo-Romantic Great » : a few months before the release of his second Barber album (Somm Records), the English pianist Leon McCawley talks about his passion for the US neo-romantic composer (The Guardian, November 18th 2010). 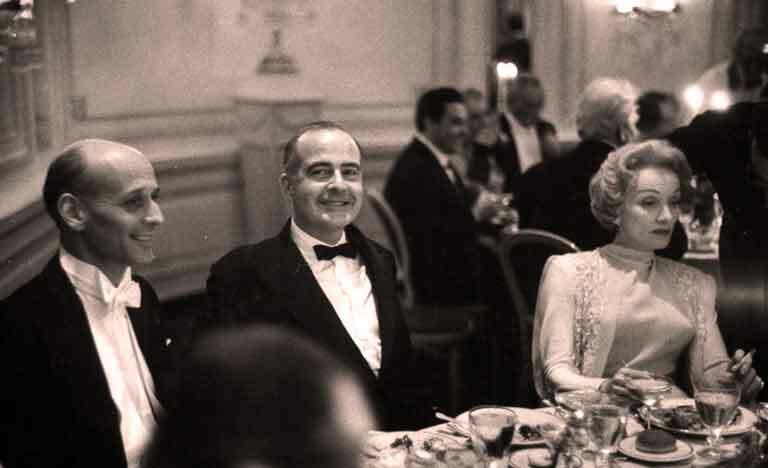 « A Sideways-Looking Genius » : portrait of Samuel Barber by Philip Clarke (Gramophone USA, July 2010). The organist Iain Quinn tells the story of his discovery of the early Christmas Eve cantata. « The Saddest Music Ever Written » : excerpt of the book by Thomas Larson, an essay on the Adagio for Strings. Official website of the music publisher Schirmer, with a beautiful commemorative text by Paul Wittke, Barber's personal editor. The website of the Curtis Institute of Music in Philadelphia. A website dedicated to violinist Iso Briselli recounting the amazing genesis of the Violin Concerto. « Echoes of Ireland » : details of the Barber Festival organized by Nóta in Dublin le 9 mars 2010. An overview of Barber's chamber music by his American biographer Barbara B. Heyman for Chamber Music America. 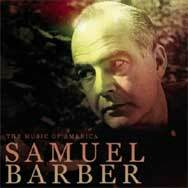 « Samuel Barber » on Wikipedia. 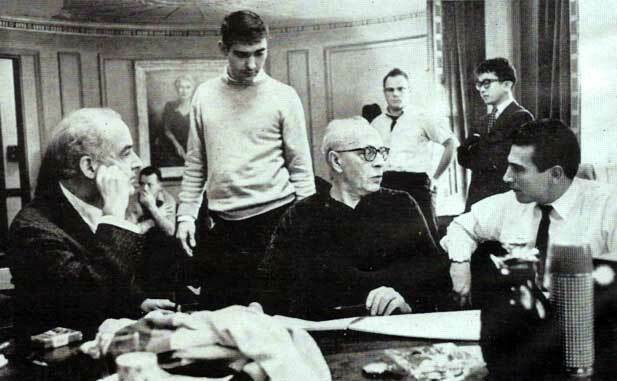 A composer at work : invited by Charles Munch in June 1951, Barber conducts the rehearsals of his Second Symphony with the Boston Symphony Orchestra. 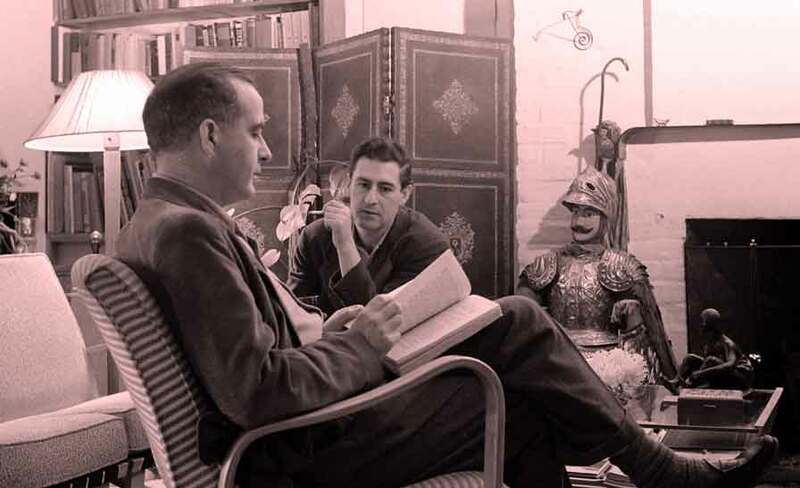 « Samuel Barber, Once Upon A Time... » : interview on the French website Qobuz about the first French biography on Barber (January 2012). 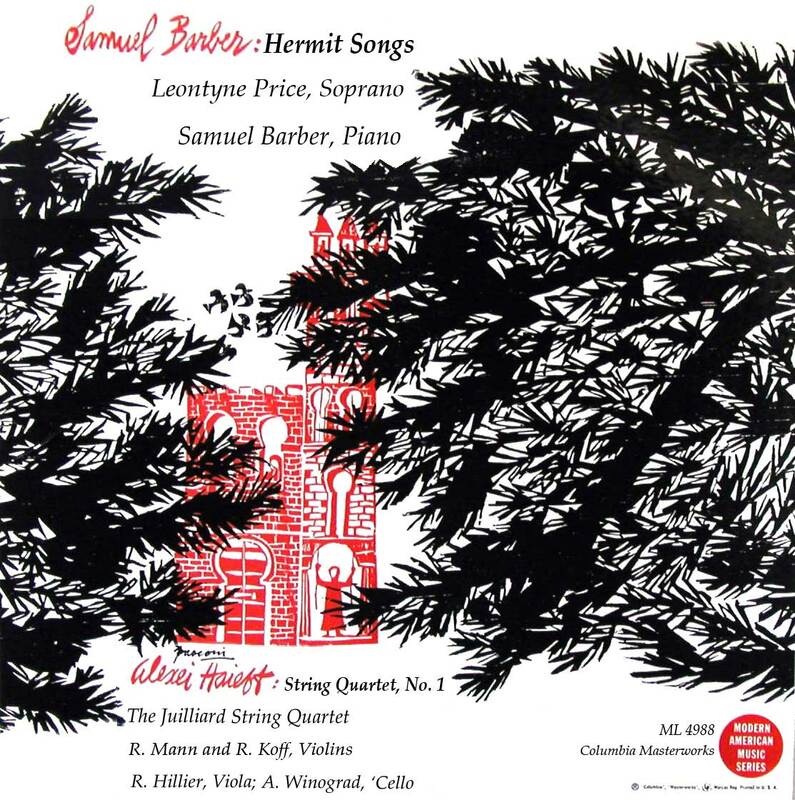 An exceptional document : in November 1959, the members of the Philadelphia Wind Quintet play Summer Music after a discussion with Samuel Barber in person ! 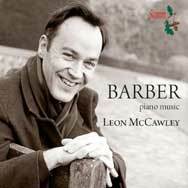 Barber's works performed by the composer and by the musicians who knew him : it's Vintage Barber, a list of archive recordings selected by the Capricorn Society. 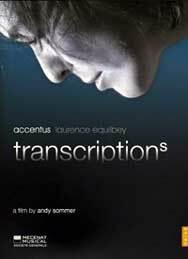 Directed by Paul H. Moon, this film is the first documentary ever made on the composer of the Adagio for Strings. Released in 2017 to critical acclaim , it features an impressive array of musicians - including Marin Alsop, Leonard Slatkin, John Corigliano, Thomas Hampson -, musicologists and scholars. A must-have for every classical music fan, Samuel Barber - Absolute Beauty has received the Opera News' Critic's Choice 2018. All the texts on this website are © Pierre Brévignon / Association Capricorn, and cannot be reproduced without prior authorization (associationcapricorn@gmail.com). All the identified audio/video documents on this website are credited within the captions. Should you recognize any of them as your content, please contact us : associationcapricorn@gmail.com. Martha Graham Center of Contemporary Dance. 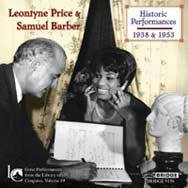 Barber plays the piano for his muse when he and Leontyne Price perform the Hermit Songs at the Library of Congress in Washington in October 1953. 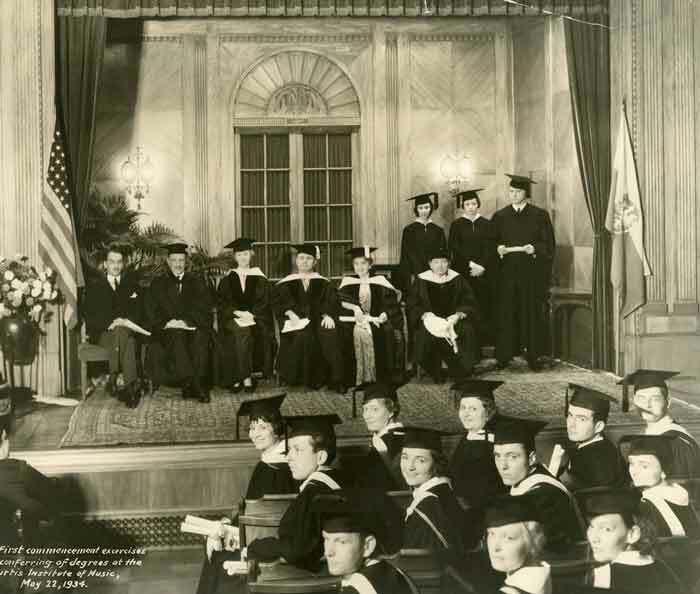 He also sings in a recital for his fellow-students at the Curtis Institute of Music for Christmas 1938. The program provides an idea of the kind of singing career Barber could easily have embarked upon. Inaccurately called The Complete Solo Piano Music. (the solo version of the Souvenirs, the second Interlude and some early pieces are missing), this album is a great introduction to Barber's piano compositions by one of his old-time accomplice: John Browning, soloist and dedicatee of the Piano Concerto who also premiered the Nocturne. A very rare opportunity to hear Barber conducting an orchestra. With the lyrical and engaging interpretation of Zara Nelsova – preferred to Raya Garbousova, who yet premiered the work -, Barber’s Cello Concerto is a compelling experience. The Symphony No. 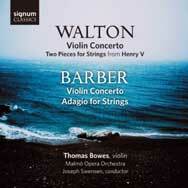 2 is an equally rare addition : composed during the war, its score was destroyed by Barber some twenty years later. Only the second movement will survive to become Night Flight. The absolute gem! 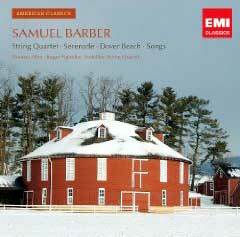 Consisting of 1935-1947 recordings, this CD features most notably two historical archives : Barber singing at 25 his own Dover Beach with the Curtis String Quartet, and the 1942 première of the Adagio by Toscanini conducting the NBC Symphony Orchestra. 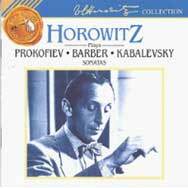 Six months after its première in Havana, Horowitz plays a highly-charged version of the Piano Sonata, unfortunately weakened by the very poor quality of the recording. His rather gutsy enthusiasm for this composition reminds us that he’d personally asked Barber to write the virtuoso final Fugue. 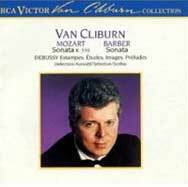 Recorded by the same label, the American Van Cliburn gives another historical interpretation of the Sonata. Paying more attention to its lyrical aspects rather than its fireworks effects, this pupil of Rosina Lhévinne underscores the filiation between Barber’s work and the Russian romantic school of piano. 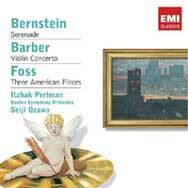 Stern and Bernstein - Barber’s “best enemy” – give an extremely melancholic and idiomatic reading of the Violin Concerto. The Piano Concerto by Browning and Szell stands undeniably a notch above the recording Browning and Leonard Slatkin would make a few years later. Four months after its much acclaimed première at the Met, this recording features the same outstanding cast (also available under the reference RCA Victor 7899-2-RG). Another recording of the European production at the 1958 Salzburg Festival (same cast except for Regina Resnik, replaced by Ira Malaniuk) is available with Orfeo (« Festspiel Dokumente », C635-0621). Recorded 17 years after the fateful première of the opera, this revised version of Antony and Cleopatra is shortened by more than an hour. This beautiful composition has been unjustly neglected, as evidenced in this production recorded during the 1983 Spoleto Festival. Currently, this is the only existing recording of Antony and Cleopatra. A historical anthology. 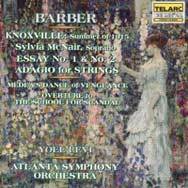 Along with a glamorous studio version of the Hermit Songs by Barber and Price, it features two masterpieces interpreted by their dedicatee : the delicate and touching Knoxville, Summer of 1915 performed by Eleanor Steber and a white-hot Andromache’s Farewell by Arroyo and Schippers. Rarely heard performing Barber’s compositions, the German Fischer-Dieskau renders Dover Beach with a beautiful Liedersanger sobriety. The two arias of Cleopatra («Give Me Some Music » and « Give Me My Robe ») are presented together in what could be seen as Barber’s first attempt at saving his doomed opera, following the disaster of the inaugural night of the new Metropolitan Opera. Leontyne Price is also “back on the scene of the crime” as the Queen of Egypt and gives a definite interpretation of these musical jewels. For Knoxville, she rises to the same level of interpretative perfection as Eleanor Steber reached. This mélange of works for orchestra and voice features a couple of rare recordings : A Stopwatch and an Ordnance Map for men’s choir, brass and percussions on a poem by Stephen Spender which relates the death of a soldier during the Spanish Civil War; and A Hand of Bridge, a ten-minute opera giving voice to the stream of consciousness of two couples playing bridge. 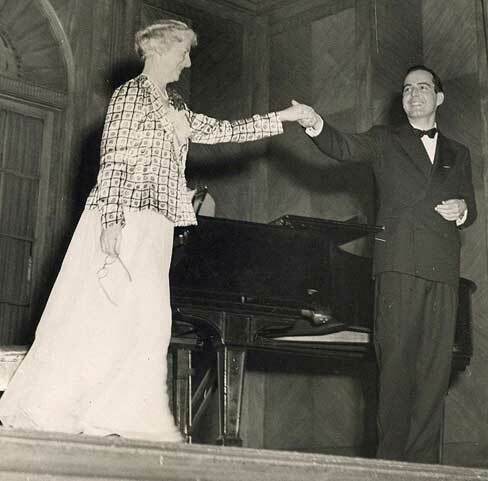 Gian Carlo Menotti leaves his mark on the libretto as in the casting of Patricia Neway, one of his emblematic singer. To this day, this mini-opera remains an all-time favorite of many students in the American colleges of music. The three concertos conducted by Slatkin form a totally coherent modern triptych, dominated by Isserlis’s version of the Cello Concerto. A great fan of the ballet Medea, in his Boston days, Munch used to get on his soapbox and expound upon its abridged setting, Meditation and Dance of Vengeance. The English baritone gives an unusual and unexpectedly convincing version of these works, highlighting their similarities with the vocal music of Britten. The Endellions prove equally convincing in their very homogeneous rendition of the String Quartet – where others (eg. the Borodine, the Lindsays, the Tokyo String Quartet) have chosen, in a more conventional fashion perhaps, to focus on the central Adagio. 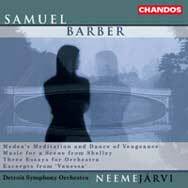 This orchestral anthology is taken from the Barber almost-complete works published by Chandos. 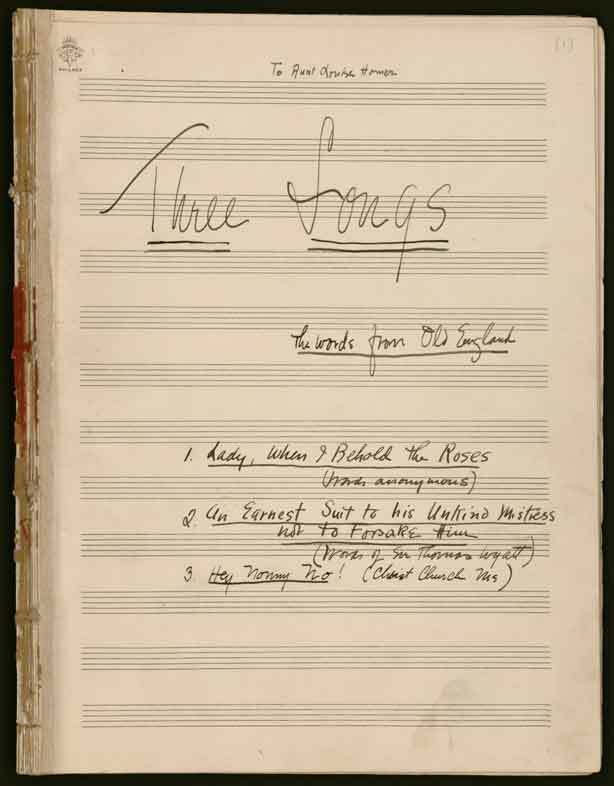 It is particularly interesting in that it features the three Essays, rarely found together on the same album. The Estonian conductor performs these rather elusive scores like Nordic symphonic poems, somewhere between Nielsen and Sibelius. An altogether very convincing album. Andrew Schenck died in 1992, aged 51. 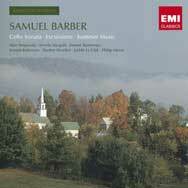 He loved Barber’s music and, during all his career, conducted it relentlessly - with various successes. 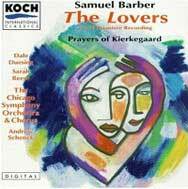 This very sensual, almost crude at times, version of the cantata The Lovers ranks among his best recordings. His Prayers of Kierkegaard however do not match the quality of Robert Shaw’s and Jorge Mester’s renditions (Telarc / Albany). 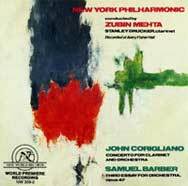 This live recording documents the first concert Mehta gave as newly appointed Musical Director of the New York Philharmonic. On that September 14th, 1978, he conducts the première of Barber’s last (fully completed) work, “an absolutely abstract, essentially dramatic music”, as described by the composer himself. The 3rd Essay fits with the neo-romantic aspects of the first two Essays as well as with the more chaotic and jagged rhythm of the Piano Concerto. An absolute must-have for all Barber fans. Initiators of the project, Browning and Hampson have added to the existing ten cycles ten early songs never released before. Cheryl Studer gives a brilliant interpretation of the Hermit Songs, while Hampson delivers a harrowing Despite and Still. With the Emerson Quartet, his Dover Beach version stands out as the jewel of this remarkable recording. Two interpretations of Knoxville Summer of 1915 that complement each other rather well : a theatrical, dramatic version by Barbara Hendricks and a more contemplative and nostalgic version by Sylvia McNair. In addition, the Telarc album features beautiful orchestral performances. 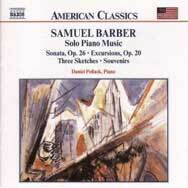 The American pianist Daniel Pollack, who has premiered the Piano Sonata in Moscow in 1958 and in China, offers with this album a contrasted panorama of Barber's works. The bitter-sweet nostalgia of the Souvenirs cycle finds here a perfect reading, and never has the Ballade been delivered with such an aristocratic poignancy. 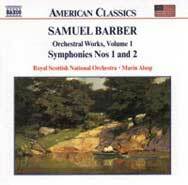 A perfect introduction to Barber’s orchestral works, with an electrifying First Symphony . 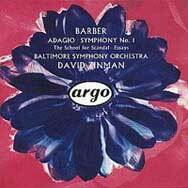 The high quality and somewhat analytical recording of the Baltimore orchestra allows for strings and brass alike to sound as soft or boisterous as they possibly could. 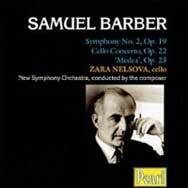 Published in 1982, this version of the Cello Concerto is the first recorded version following the initial one by Zara Nelsova and Samuel Barber. 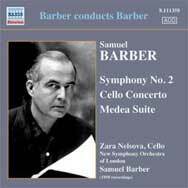 The chamber-like texture of the orchestra provides an ideal cocoon to the energetic and accurate interpretation of the English cellist. While Wallfisch takes into account the dramatic aspect of the work, he successfully chooses to focus on its elegiac tone. The American violinist Robert McDuffie, who received the advice of Barber in person regarding his playing of the Concerto, gives a wonderful reading of Barber’s work, in a perfectly balanced interpretation between the sentimental and the virtuoso. John Kimura Parker’s version of the Piano Concerto sounds however somewhat distant and disembodied. The Browning/Szell version remains preferable. 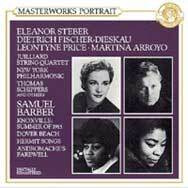 Barber's Dover Beach has been graced by 1st class performances in a plethoric discography, from Fischer-Dieskau to Gerald Finley and Thomas Allen. 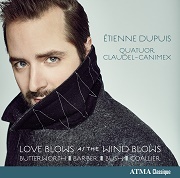 In his first solo album, the Quebecker baritone Étienne Dupuis is overshadowed by his prestigious predecessors. If his voice has a velvety timbre and an impressive largeness, the phrasing could be more nuanced to express all the juvenile intensity of Matthew Arnold's poem. Here, the text is delivered with a curious detachment. The accompaniment by the Claudel-Canimex String Quartet sounds equally atonic - as well as their performance of the Adagio, more cerebral than visceral. The rest of the program offers a refreshingly unusual selection of works for voice and string quartet. This live concert of the United States Marines Band offers the opportunity to discover a new side of Barber’s music. If it appears quite trivial and almost ironical with its pompous accents, the Commando March (1943) is straightforward and efficient in its primary task : support the morale of the troops (it will be Barber’s most performed work in the USA, with the Adagio for Strings, during World War II). More intriguing and mesmerizing, Medea’s Meditation and Dance of Vengeance reveals the real « warlike » facet of Barber’s inspiration. Here, the music – drawn from a ballet commissioned by Martha Graham – switch abruptly from hypnotical stillness to Dionysian frenzy. 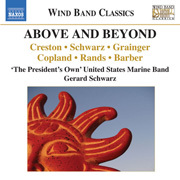 The wind band arrangement (with piano) by Frank Hudson underlines all the sharpness, syncopations and angular rythms of this splendid symphonic poem. The virtuosos of the President’s own are the perfect advocates for this ambitious program (Bernard Rands’Ceremonial and Aaron Copland’s Emblems are just as fascinating). 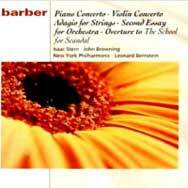 Barber's Piano Concerto is a strange beast, a monster with many heads, difficult to seize and master. The pianists who had the courage to confront it can be counted on the fingers of two hands (one hand is enough as far as the first-rate performances are concerned). 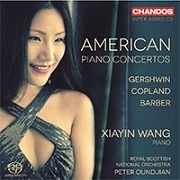 The young Chinese Xiayin Wang, whose love for American music seems to be engraved in her DNA (Gershwin, Earl Wild and Richard Danielpour bear the lion's share in her repertoire), succeeds brilliantly in taming this pianistic Hydra. Intensely poetic in the Canzone, with its dreamlike lullaby rythm, she tackles the baffling introduction, full of shadows and unanswered questions, and the conclusive Allegro molto, driven by a disheveled motorism, with a extra touch of soul. Under Peter Oundjian's baton, the RSNO deploys a range of radiant colours, in its tempetuous roarings as well as in its intimate murmurs. A feast of a recording - Copland's and Gershwin's concertos being just as accomplished ! It's quite surprising to find associated, on the same CD cover, the name of Barber with two mavericks such as Steve Reich and Morton Feldman. Yet, there is an implicit connection between the severe expressionism of Barber's war piece, A Stopwatch and an Orndance Map, the obsessive loop of Proverb and the haughty statism of Rothko Chapel. The three works are the soundtracks of a mysterious ceremonial, both uncanny and dramatic, and they attain their maximal expressivity with a remarkable economy of means. 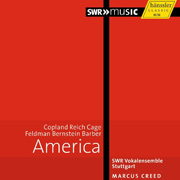 A very fine album of American choral music, proving once more the excellence of Marcus Creed and his SWR Vokalensemble Stuttgart. 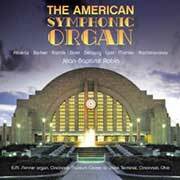 The Adagio has been recorded in various arrangements but, unless we're mistaken, this organ transcription by Jean-Baptiste Robin is a world-premiere on disc. Alas, the rendition sounds strangely sluggish, monochromatic, drown in a problematic reverberation. Maybe the organ is not the right instrument for this work ? The divine surprise comes from the French Ensemble Matheus and its conductor Jean-Christophe Spinosi. Mainly known for its brightly performances of baroque music on period instruments, it has recorded for the prestigious Deutsche Grammophon a thematic program resolutely off the beaten track : the Adagio in its string orchestra version dialogues with the Bach family (Johann Sebastian and Johann Christoph), Shostakovich and Nicolas Bacri. 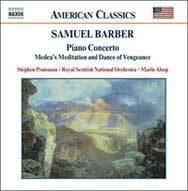 From the very first measures, Barber's intense dirge sounds like a baroque lamento. 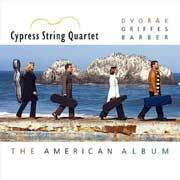 All through the arch-like architecture of the work, the fortrightness and the sharpess of the strings are evocative of the young Barber's most vivid inspirations : Bach, of course, but also Monteverdi and the English madrigalists. This Adagio alone would justify the purchase of this disc ; but don't miss the other works of the program, they're all first-class performances ! The Adagio has been recorded in various arrangements but, unless we're mistaken, this organ transcription by Jean-Baptiste Robin is a world-premiere on disc. Alas, the rendition sounds strangely sluggish, monochromatic, drown in a problematic reverberation. Maybe the organ is not the right instrument for this work ? 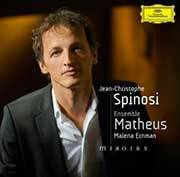 The divine surprise comes from the French Ensemble Matheus and its conductor Jean-Christophe Spinosi. Mainly known for its brightly performances of baroque music on period instruments, it has recorded for the prestigious Deutsche Grammophon a thematic program resolutely off the beaten track : the Adagio in its string orchestra version dialogues with the Bach family (Johann Sebastian and Johann Christoph), Chostakovitch and Nicolas Bacri. 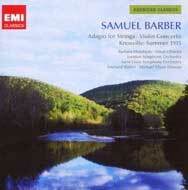 From the very first measures, Barber's intense dirge sounds like a baroque lamento. All through the arch-like architecture of the work, the fortrightness and the sharpess of the strings are evocative of the young Barber's most vivd inspirations : Bach, of course, but also Monteverdi and the English madrigalists. This Adagio alone would justify the purchase of this disc ; but don't miss the other works of the program, they're all first-class performances ! It was quite obvious when he conducted, a few years ago, the Dallas Symphony Orchestra in the Piano Concerto (with Leon McCawley), and this new recording now confirms it : Andrew Litton is a great (and unsung) Barberian conductor. Under his baton, the Bergen Philharmonic delivers a powerful and heartbreaking rendition of both the Adagio for Strings and the Cello Concerto. 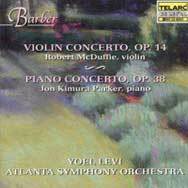 If the Violin Concerto is really Barber's "war concerto", this one, composed in 1945, sounds like a "Hymn for Peace", with its dream-like Andante and its splendid lyrical themes. 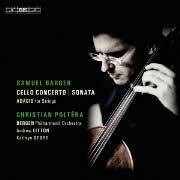 Christian Poltéra's cello is a marvel of delicacy and strength, but achieves also a youthful impetuosity in the Cello Sonata with his favorite "partner in crime", the pianist Kathryn Stott. 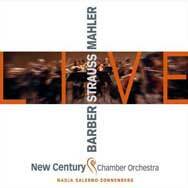 Three modern references in one CD : what more could a Barberian fan ask for ? 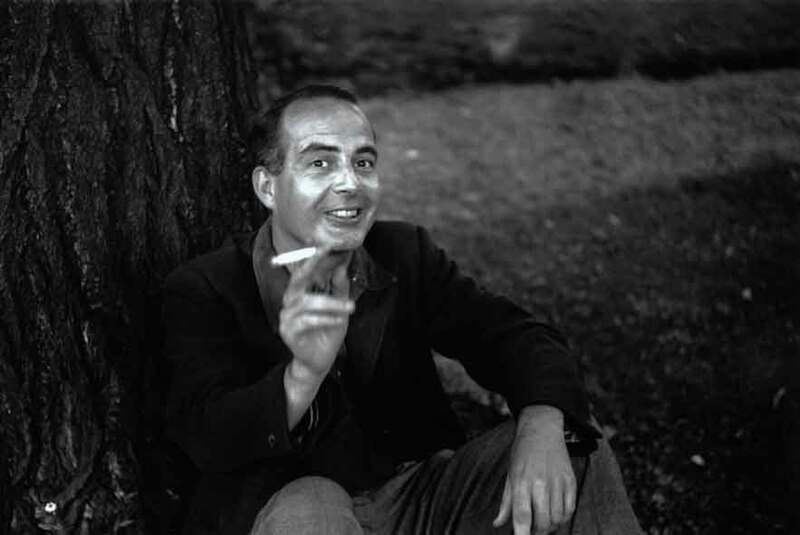 For too many years, The Lovers, a striking cantata composed by Barber at the end of his life on poems by Pablo Neruda, has been available only in one recording. At long last, a modern version is now released, and it comes in a new guise : originally composed for a large orchestra, the work has been transcribed (by Robert Kyr) for a small instrumental ensemble, to clarify the dense polyphony of the music and, in a way, duplicate the sense of intimacy expressed in the poems (take from Twenty Love Poems and a Song of Despair). 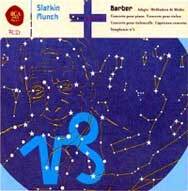 Unfortunately, Barber's lyricism sounds a bit thin here, and the almost telluric eroticism of the Chilean poet is quickly forgotten. The voices of Conspirare are perfectly balanced, with a great attention to nuances and dynamics, but the soloist David Farwig fails to really perform the words he sings. 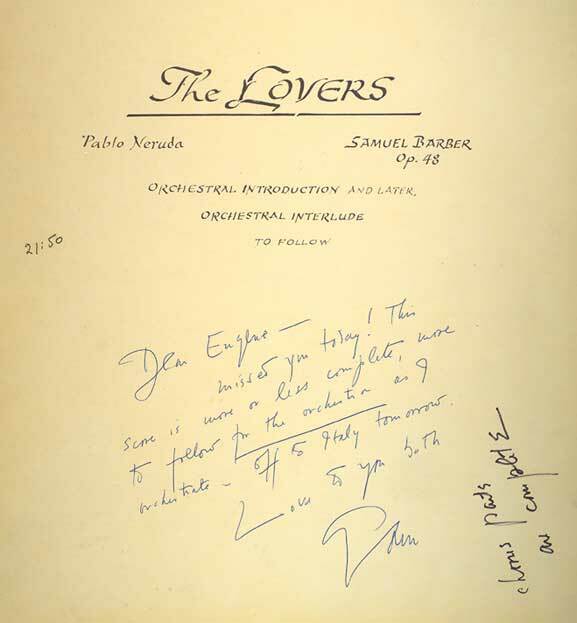 A "semi-success", this new recording of The Lovers is luckily complemented by wonderful renditions of choral pieces, from the most famous (Agnus Dei, Sure on this shining night) to the not-so-known (opp.8 and 42) or almost experimental (the brief A Stopwatch and an Ordnance Map, with its impressive timpani accompaniment). For his first CD, the Dutch pianist Lodewijk Crommelin has put together a very original and intelligent compilation of neo-romantic works by two American composers of different generations. 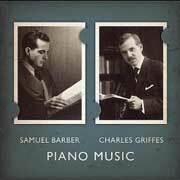 While Charles Griffes' music can be described as impressionistic, Barber's is more obviously eclectic and daring. Crommelin tackles Barber's Sonata with very impressive touch and rythmic instinct, sounding at time almost haughty - which is fine with this intimidating masterwork. On the other side, the subtler pieces (Nocturne and Ballade) sound a little bit harsh. Maybe the instrument is to blame, with its narrow range of colors... The evanescent poetry of Griffes' pieces gets a little bit lost in translation. 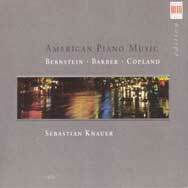 Nevertheless, a very promising album, offering a fascinating overview of America's music for piano of the XXth century. More than ever, Barber's music comes alive thanks to a young generation of artists. 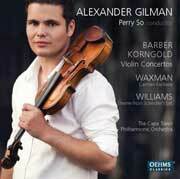 Alexander Gilman, 29 years old, and Mikhail Simonyan, 26, offer two distinct approaches of the Violin Concerto : sensuously vibrant for the first one, with a shimmering orchestral background, breathtakingly virtuoso for the second one, with an unbridled London Symphony Orchestra under the hot-headed command of Kristjan Järvi. 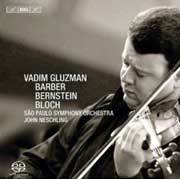 The Korngold/Waxman/Williams works by Gilman sound more interesting than Simonyan's rendition of Khachaturian's Violin Concerto, but the two CDs remain highly commandable ! 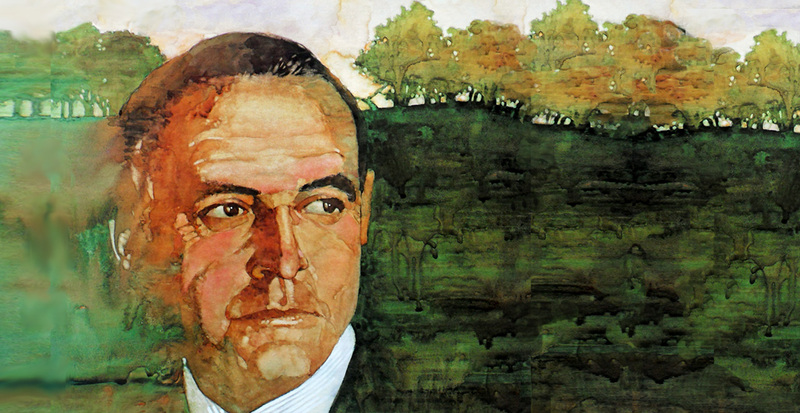 Almost fifteen years ago, the musical world discovered a young English pianist through a dazzling Samuel Barber album (see below, "The Young Generation"). This year, after touring in England and in the USA for Barber's centennial, Leon McCawley revisits the composer's music, adding to the usual program the Sketches, three delightful early pieces, and the second Interlude, where Barber pays sumptuously his debt to Brahms. The pianist's talent is as versatile as ever, but his new approach underlines brilliantly the dramatism of the Sonata, while the subtle enigma of the Ballade takes a new resonance, almost schumannesque, under his fingers. The high quality of the sound recording gives an added value to this album, undoubtedly the most satisfying modern version of Barber's pianistic output. 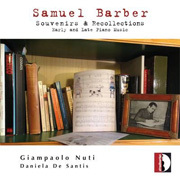 This extraordinay boxset is a cornucopia of rare archives documenting more than 25 years of historical recordings, from Dover Beach sung by a young baritone named Samuel Barber to the world premiere of Die Natali. The casting is of the utmost artistic quality and the program offers several gems : the original version of the Violin Concerto and its revised version, the String Quartet with its original third movement or a rehearsal of the Symphony No. 2 with Barber conducting the Boston Symphony Orchestra ! 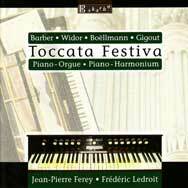 This 2-CDs album offers several milestones of the piano music composed in the first half of the XXth century. 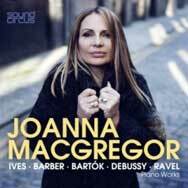 The English pianist Joanna MacGregor delivers a very dramatic performance of Barber's Piano Sonata, underlining brilliantly its numerous contrasts (the ominous Allegro energico and slow movement counterbalancing the quicksilver quality of the scherzo and the breathtaking motorism of the fuga). She's equally at ease with the humorous Excursions, where her lightness of touch works wonders. A fascinating account of Barber's piano output, and an ideal way to explore the modern musical trends of XXth century music. This very consistent (though a little bit too brief) program features the newly founded NCCO, whose leader is the Italo-American violonist Nadja Salerno-Sonnenberg. Its approach of the Adagio for Strings is at first surprising, with a very slow tempo (at 10', just between Bernstein and Celibidache), but it proves extremely effective : where Lenny and his musicians (from the LA Philharmonic and the NY Philharmonic, no less) sound erratic and at a loss, the NCCO (without conductor, and live) gives a convincing performance, stretching with extreme clarity the subtle polyphony of the strings and handling with confidence the heart-wrenching crescendo. Even the silence after the famous climax is perfectly timed, letting Barber's music resonate without completely dying... Very powerful and inspired. 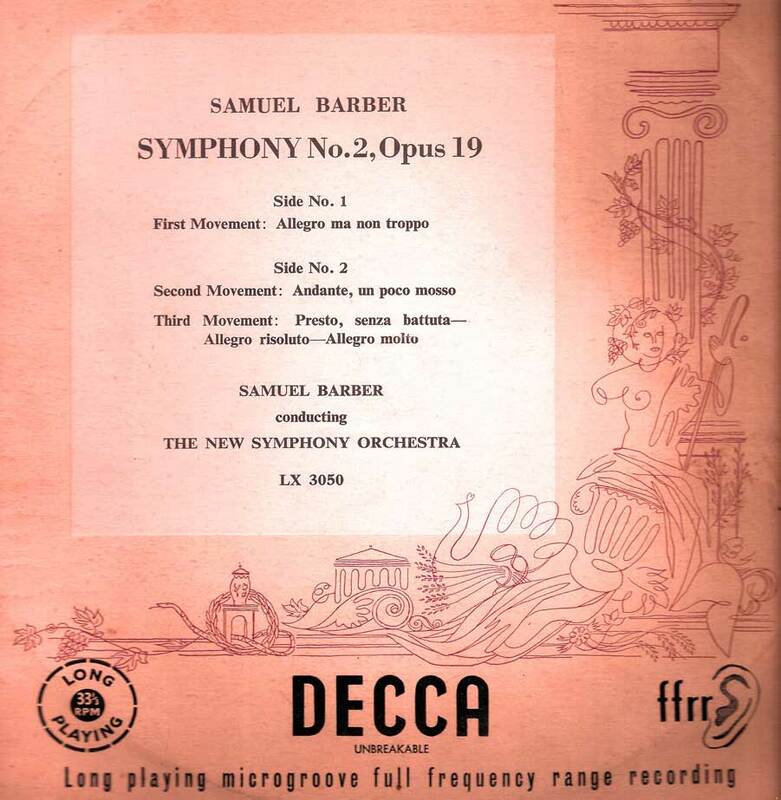 We knew Barber as a singer and pianist : in this new release by Naxos, he conducts three of his latest works in a historical Decca recording of December 1950 - including the Symphony No. 2, that he'd choose a few years later to withdraw. Very intense and risky performances, enhanced by a wonderful audio restoration, far superior to the similar album published by Pearl. A rare pianist with a carefully chosen repertoire (Schnittke, Chostakovitch, Alkan, Busoni, Berio), Giampaolo Nuti shares an amazing affinity with Barber's music. This recording shows him equally at ease in the dissonnant, elegiac or motoristic moments of the Piano Concerto. The RAI Symphony Orchestra under Daniel Kawka's baton give a tremendous performance of the 3 Essays, eloquently enhancing their poetic or dramatic qualities. A must-have for all Barber-fans ! First Symphony , Overture to "The School for Scandal", Violin Concerto, Essay for Orchestra No. 2, Medea's Meditation and Dance of Vengeance, Adagio Piano Sonata, String Quartet, Dover Beach, Hermit Songs, 3 Songs, Knoxville Summer of 1915, Agnus Dei, 2 Songs from Antony and Cleopatra, Must the Winter Come So Soon ? Here is the anthology of the Centennial, interspersing wonderful historical recordings (Knoxville and the Hermit Songs by Leontyne Price, the Piano Sonata by Horowitz, the Violin Concerto by Stern and Bernstein) with modern interpretations (the Symphony in One Movement by Slatkin, the Tokyo String Quartet in the world-famous String Quartet). 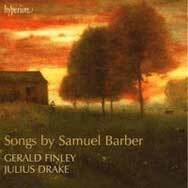 And straight from the vaults of the Curtis Institute of Music, the proverbial cherry on the cake : a very impressive recording of Dover Beach by the 25-years-old composer in person ! 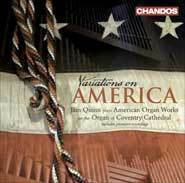 Inspired conducting, eloquent orchestra & soloists : a highly recommendable 6-CD set ! Under the title "New York Connections", this cleverly devised recital offers an overview of the 20th century American piano, firmly rooted in jazz and blues. 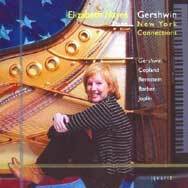 Elizabeth Hayes delivers an energetic performance of Barber's Excursions, but is equally at ease with its more poetic (Slow Blues Tempo) or humorous tones (the final Hoe-Down). 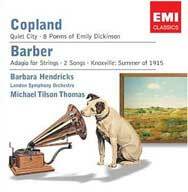 Great renditions of Joplin's ragtimes and Copland's Four Piano Blues. There is a gap of thirty years between the Prelude and Fugue, recorded here for the first time, and the variations on Wondrous Love. It's no surprise, then, if the quality of inspiration between the student of the Curtis Institute and the composer in full bloom reveals the same kind of gap. 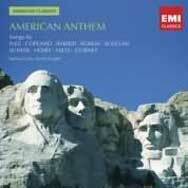 An interesting album, though, especially for the Variations on America by Aaron Copland. 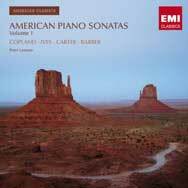 With an amazing technical mastery, the young American pianist delivers a very melodic Piano Sonata - at the risk of under-estimating its dramatic tone. It's therefore no wonder if she seems more at ease in the "playful" parts of the work - the scherzo and the final fugue - than in the initial Allegro, tense and imperious, or in the nocturnal, almost bartokian, Adagio mesto. 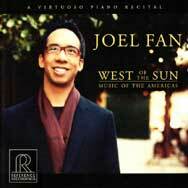 From Argentina to the West Indies and from Brazil... to the USA, Joel Fan invites us to a journey to the Americas. 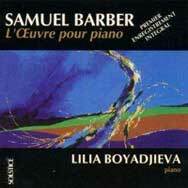 His reading of Barber's Piano Sonata conveys a striking sense of limpidity, in a beautiful and velvety sound. 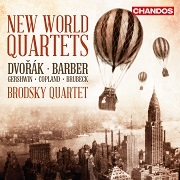 Rather than virtuosity, Fan displays a very hedonistic touch that underscores, surprisingly, the connection between this composition and the piano works of Debussy and Bartok. A most expressionist version of this concert aria which gives a taste of the aesthetic atmosphere of Antony and Cleopatra. With a timber as compelling as ever, Jennifer Larmore enacts a woman, at times rebellious, loving, furious, resigned… Barber’s music has rarely offered such a variety of climates and orchestral colors. 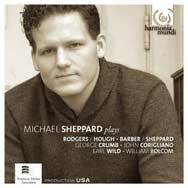 An excellent modern recording of this work, that equals in intensity the Roberta Alexander performance (CD Etcetera). A rather strange title (« The American Virtuoso ») for this recital featuring Nocturne and Ballade, two compositions in which Barber pays a not so virtuoso homage to Chopin and Schumann. Paul Barnes does not sound as comfortable in these works as he does with the Sonata, in his interpretation full of energy and musicality. One may regret the lingering impression that the piano was placed in a water tank rather than a recording studio. 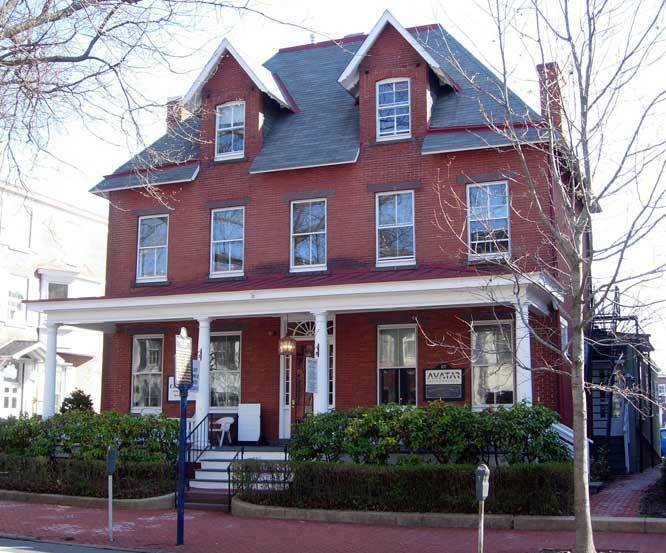 The Cello Sonata was written during Barber’s training years at the Curtis Institute of Music in Philadelphia and exudes the love the young composer felt for Brahms’s music. 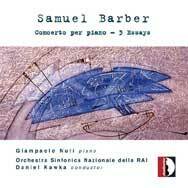 The future development of Barber’s musical style is almost palpable in the Blaumane/Katsnelson recording, with its strong sense of drama, its long melodic lines and their declamatory style. 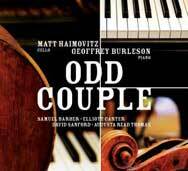 The « Odd Couple » Matt Haimovitz and Geoffrey Burleson give a somewhat dry interpretation of a piece where sudden changes in rhythm seem to compensate for an otherwise flat musical line.. The Cello Sonata was written during Barber’s training years at the Curtis Institute of Music in Philadelphia and exudes the love the young composer felt for Brahms’s music. 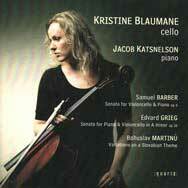 The future development of Barber’s musical style is almost palpable in the Blaumane/Katsnelson recording, with its strong sense of drama, its long melodic lines and their declamatory style. The « Odd Couple » Matt Haimovitz and Geoffrey Burleson give a somewhat dry interpretation of a piece where sudden changes in rhythm seem to compensate for an otherwise flat musical line. 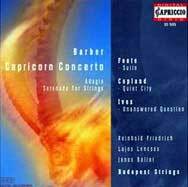 Of the three pieces featured in the program, the Capricorn Concerto is certainly worth a good listening – as much as the very naive CD cover is worth a good laugh ! Not as light-hearted as it may initially sound, this composition reminiscent of the concerto grosso genre pays tribute to the “neo-classical Axis” Bach-Stravinsky-Martinu. The trio, particularly the oboe-player, Lajos Lencsés, gives an ideally vivid and playful interpretation. 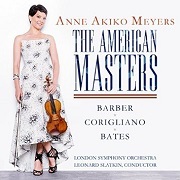 The budget-label Naxos strikes hard with the release of Barber’s complete works for orchestra under the baton of Marin Alsop, one of the most talented conductors of the young generation. Leading the Royal Scottish National Orchestra, she instills eloquence, instinct and energy into each of these performances. The six volumes are, overall, of excellent quality, especially the Piano and Cello Concertos (with Stephen Prutsman and Wendy Warner), the Medea ballet and Knoxville Summer of 1915 (with Karina Gauvin). The two symphonies are both outstanding – the second being a personal favorite of Marin Alsop. 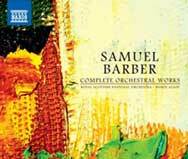 Fans of Barber should add to their Naxos collection the complete works for choir (Ormond College Choir). The Canadian baritone Gerald Finley discovered Barber's music through Thomas Allen's recording of Dover Beach. 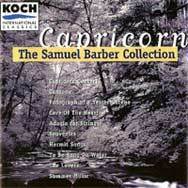 This selection of Barber's songs is just as astounding. Finley delivers a very fine performance of the Mélodies Passagères, based on French poems by Rilke and dedicated to Francis Poulenc. The rest of the program is equally inspired, and earned this CD the Gramophone Award 2008 for the best solo vocal recording. Recorded during the triumphant series of performances at the Barbican Center of London in 2003, this Vanessa is an absolute modern reference. Susan Graham is a breathtakingly natural Erika, while Catherine Wyn-Rogers sounds cut to enact the Baroness. In the leading role, Christine Brewer is no smaller Vanessa than Eleanor Steber was. Slatkin manages to instill big-scale drama into this “chamber drama” (shortened from 4 to 3 acts) and the orchestra plays with vivid richness. A desert island disc. 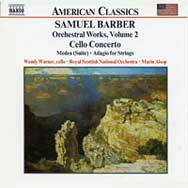 The Violin Concerto is probably Barber’s most popular work for orchestra, together with the Adagio. At the turn of the 21st century, a number of great virtuosos gave wonderful interpretations of the Concerto : Itzhak Perlman (EMI), Hilary Hahn (Sony), Anne Akiko Meyers (RCA), Joshua Bell (Decca). In quite a miraculous way, the 31 year-old James Ehnes and 22 year-old Gil Shaham somehow managed to oust those prestigious versions. The two musicians have so many qualities in common that they are impossible to tell apart : complete technical mastery serving maximum expressivity as well as astounding mastery of all registers (drama, humor, playfulness and nostalgia. 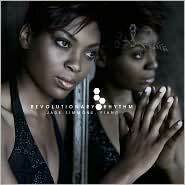 ), a sumptuous sound and permanent complicity with a totally committed orchestra. The same qualities appear in their respective rendition of the Korngold Concerto. 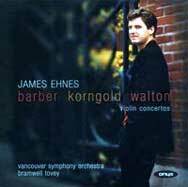 The Walton is an extraordinary fill-up in Ehnes’ album. French musicians seem still quite reluctant to venture into the American repertoire. Hence the surprise with this brilliant interpretation of Barber’s Cello Concerto by Anne Gastinel. No heated argument in her dialogue with the orchestra, but a genuinely passionate conversation that’s full of clarity. 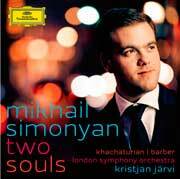 The cellist unfolds the Andante, the emotional heart of this masterwork, with a noble, desolate and poignant bow. Released in 1997, this recording by a 24 year-old British pianist is much more than a “debut album”. 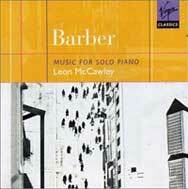 It is simply the best contemporary anthology of Barber’s piano works. McCawley skims above the technical difficulty of the Sonata, plays the Excursions and Souvenirs with panache and humor, throws himself in the three miniatures of the program with an exquisite sense of poetry. A revelation that already sounds like a consecration. While always under control, Hamelin’s interpretation, stirring and crystal-clear, transcends the Piano Sonata to make a monument of harmony, strength and euphoria out of it. 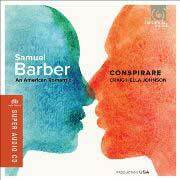 The Concord Sonata of Charles Ives is a provocative addition to this album : Barber hated Ives’ music ! 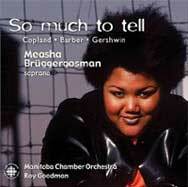 Before becoming the rising star of Deutsche Grammophon, Measha Brueggergosman recorded this all-American program at the beginning of her career. Both the quality of the chamber orchestra and the talent of the Canadian soprano as a story-teller give that little bit of extra something that makes the cozy atmosphere of this album a highly enjoyable experience. Composed in 1960 especially for the brand new Aeolian-Skinner organ of the Curtis Institute of Music, the Toccata Festiva is a one-movement organ concerto in disguise. 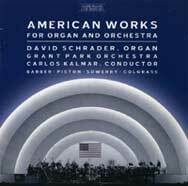 David Schrader and Carlos Kalmar sign a wonderful interpretation, both sparkling and dramatic. The recording mirrors the spot-on organ/orchestra balance. Fifteen minutes of musical bliss. 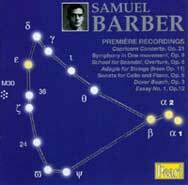 Published in 1995, this almost complete recording of Barber's song-cycles (the Mélodies passagères and the 3 Songs op.45 are missing) featured the world-premiere of Despite and Still. 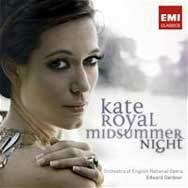 Roberta Alexander's performance impresses by its technical mastery and extreme versatility : the singer is equally at ease with the intimistic art songs of the op.13 and with more dramatic songs such as I Hear an Army, Nuvoletta or the always surprising Hermit Songs. Today, the Young Generation is the third generation of interpreters, with their own stimulating and inventive approach to Barber’s music. Thanks to their enthusiasm, Barber’s works are still regularly recorded in studios and performed in concert halls all over the world. The three lists below will be updated as new recordings are released.